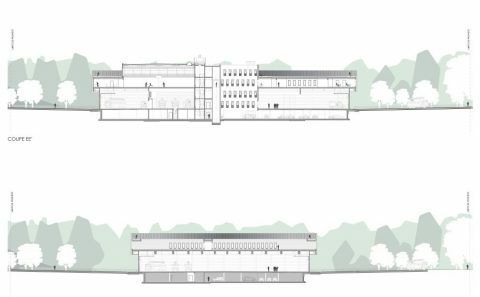 Considering the specific characteristics of the site, the architecture of the project is simple, contemporary, compact and functional (flow of people and vehicles) while offering an iconic and recognisable form, compatible with the firm tertiary character of the environment. 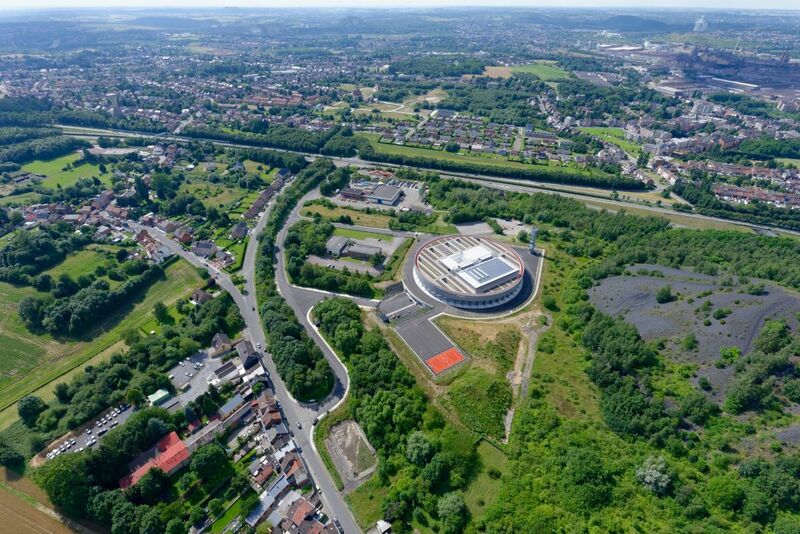 Easy access to the nearby motorway is essential for the station’s location. 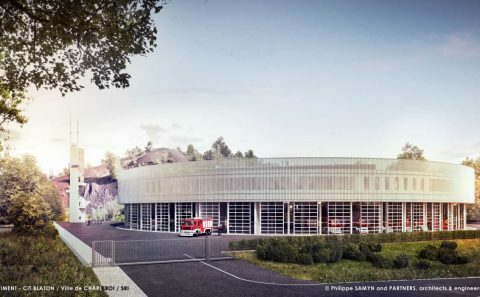 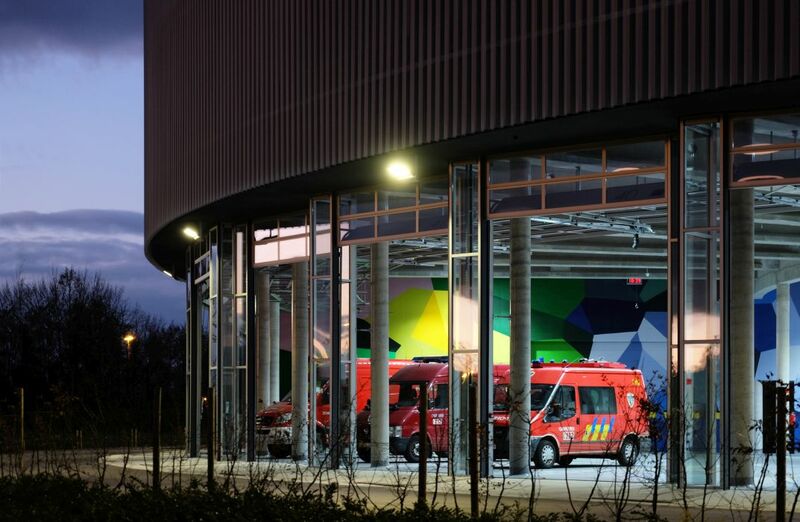 It is therefore crucial that the selection of this site is reinforced by the fast and safe transport of vehicles and people in case of emergency. 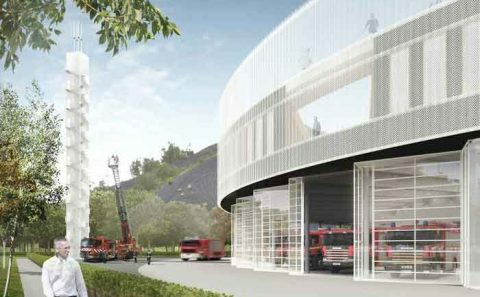 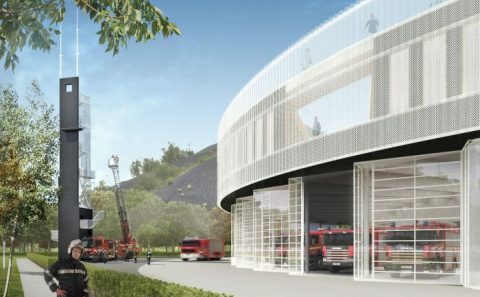 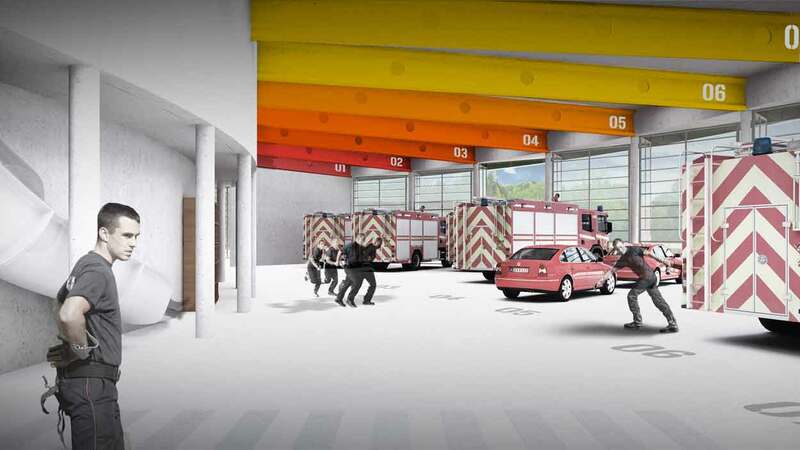 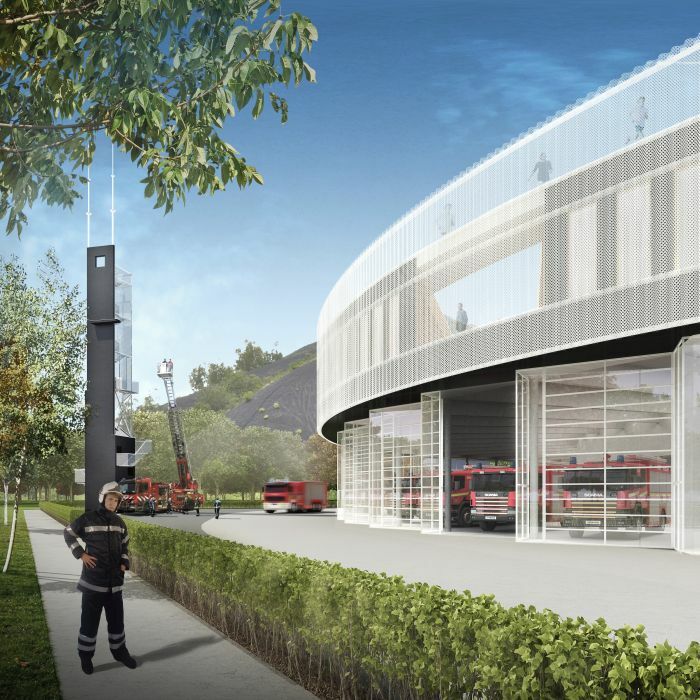 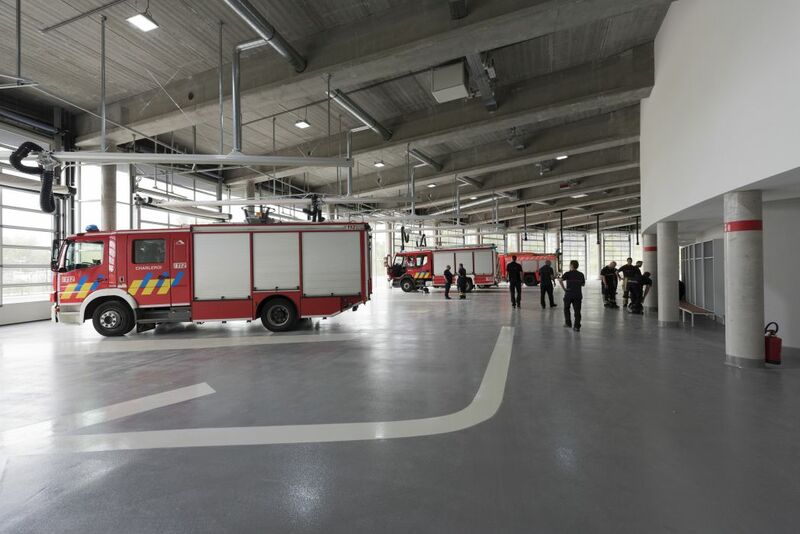 Consequently, all efforts are made in order to reduce the response time of the fire station. 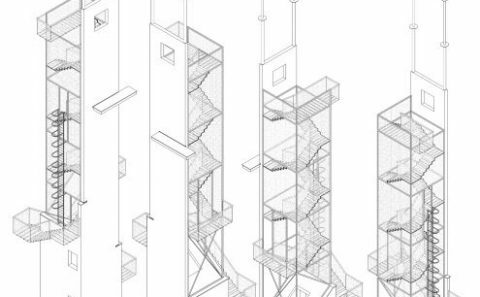 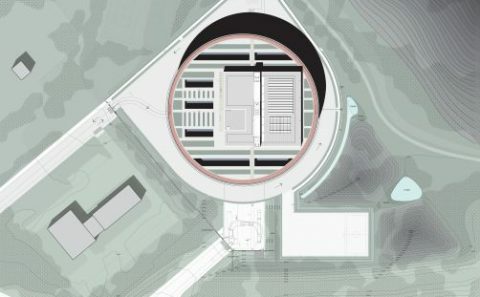 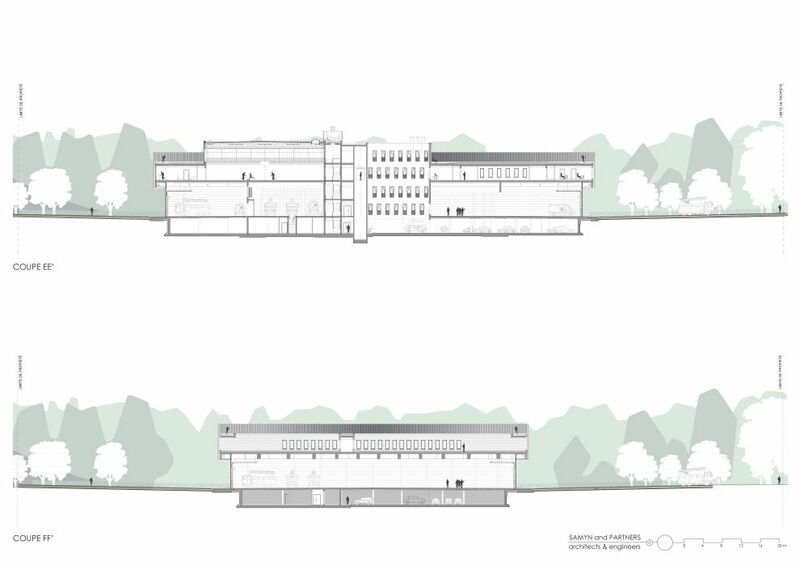 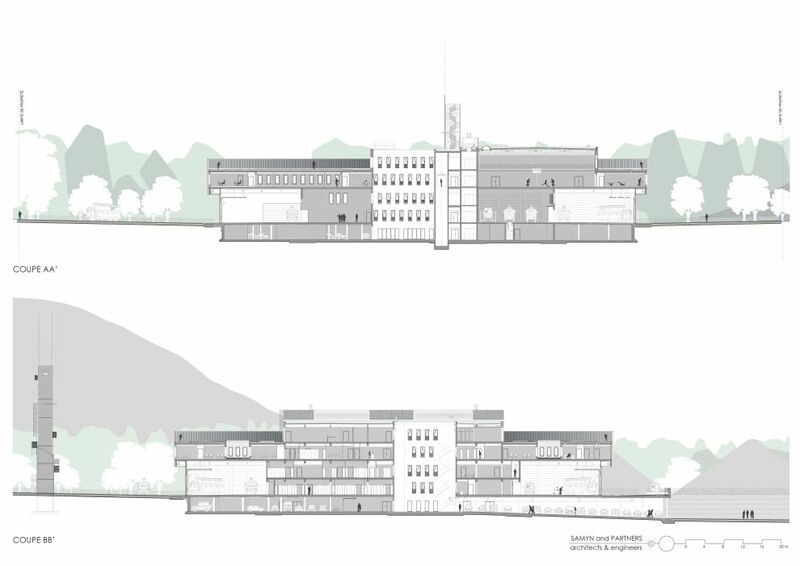 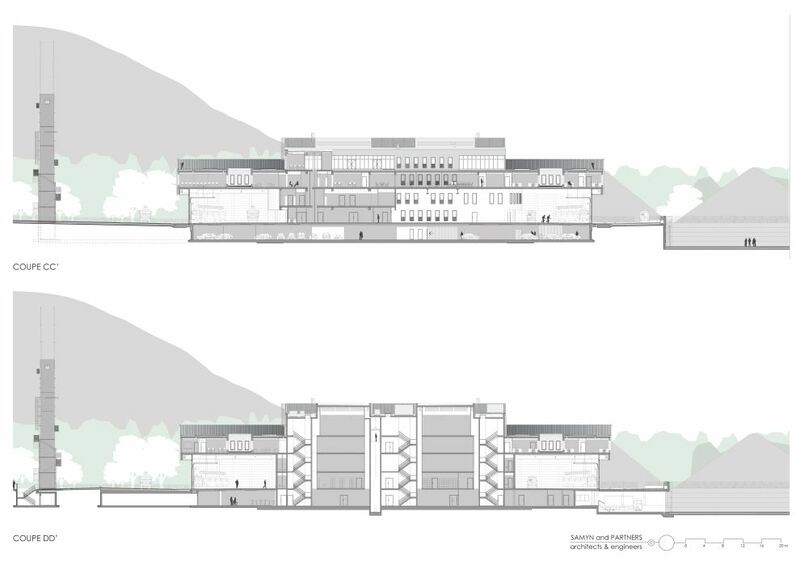 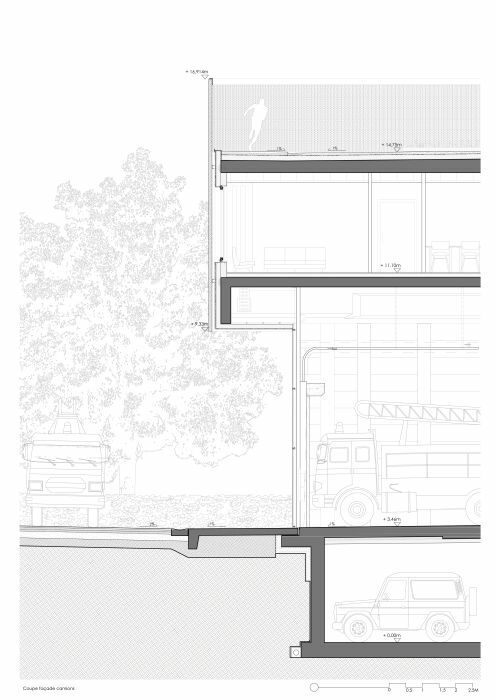 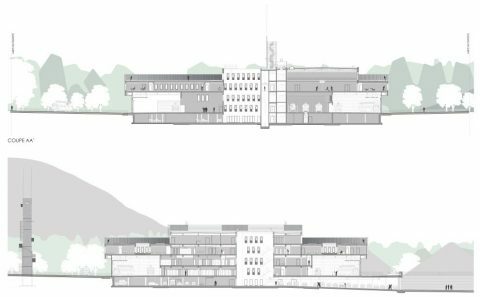 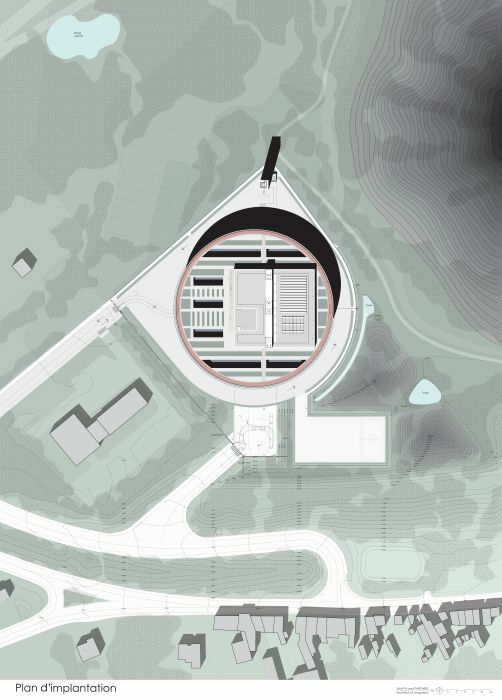 The location of the building is the result of a study aimed at combining the responses to the constraints given by the site: large drop, neighbourhood, driveways, low ground bearing, wind direction, solar orientation, etc. 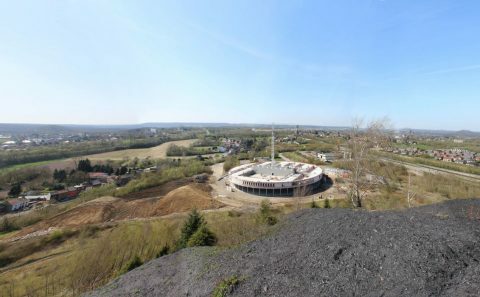 The location of the building, in the upper and flattest part of the ground, limits the excavation and backfill associated with the construction. 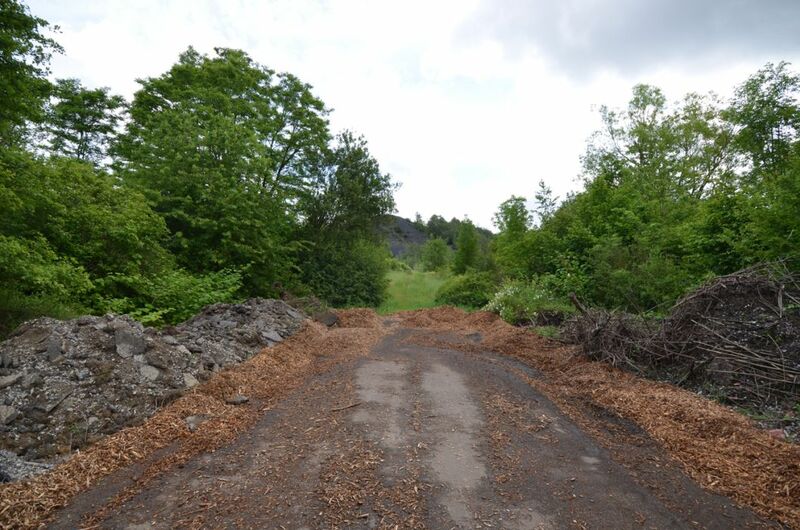 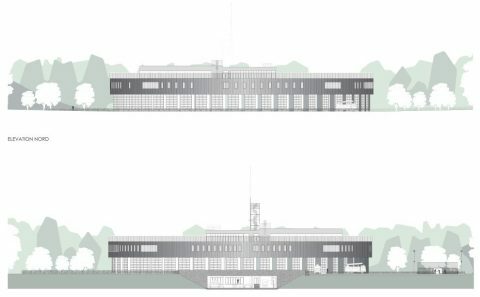 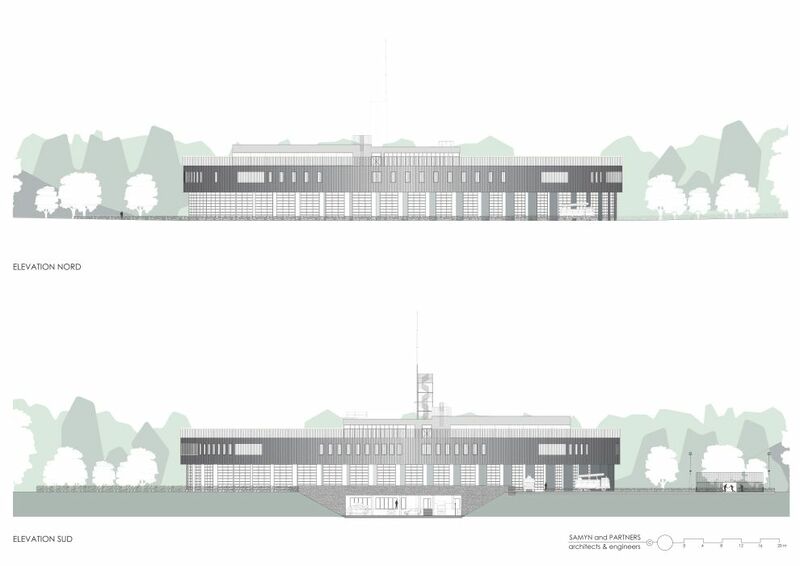 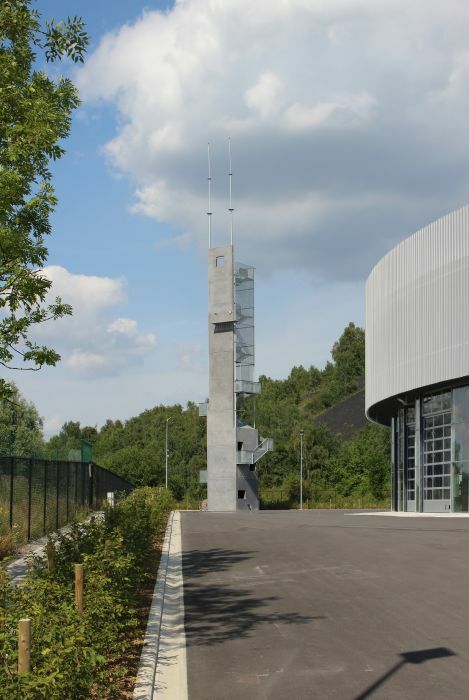 The two existing driveways, the first used for emergencies and the second for personnel and visitor access, are positioned in order to limit the length of the roads. 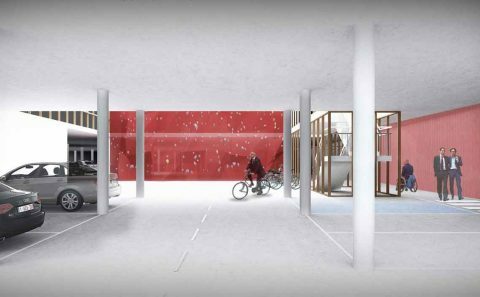 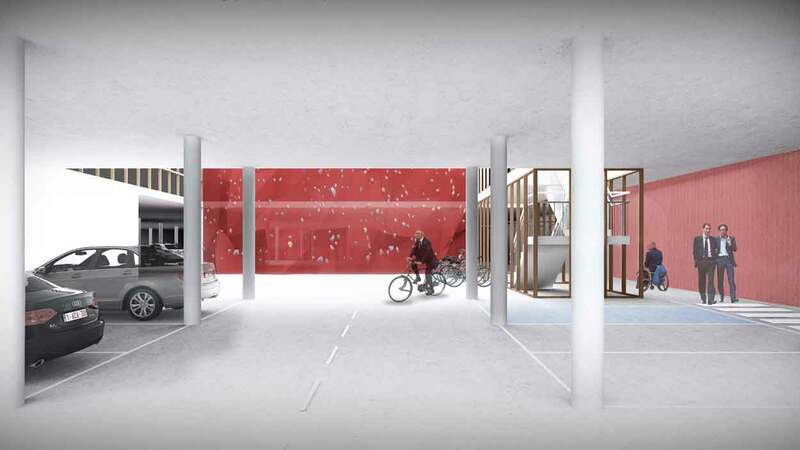 The hollow made by the south access creates the entrance to the building at ground level (pedestrians, bicycles and cars), as well as an area accessible to delivery vans. 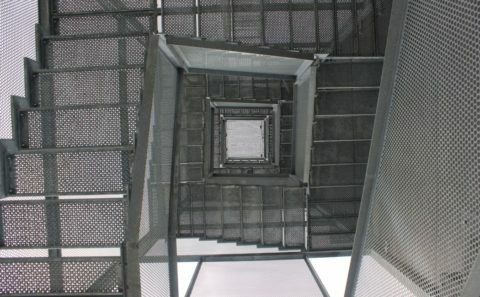 Access to the west, which is higher, establishes the first level of the building as the emergency level. 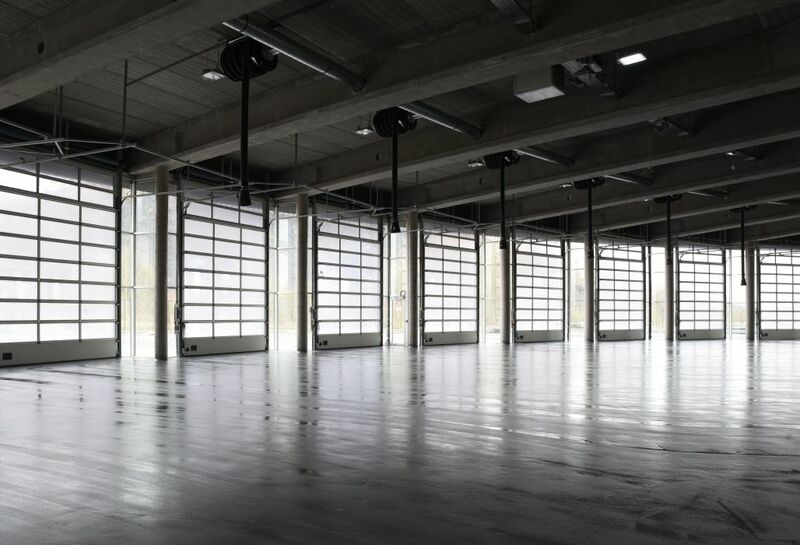 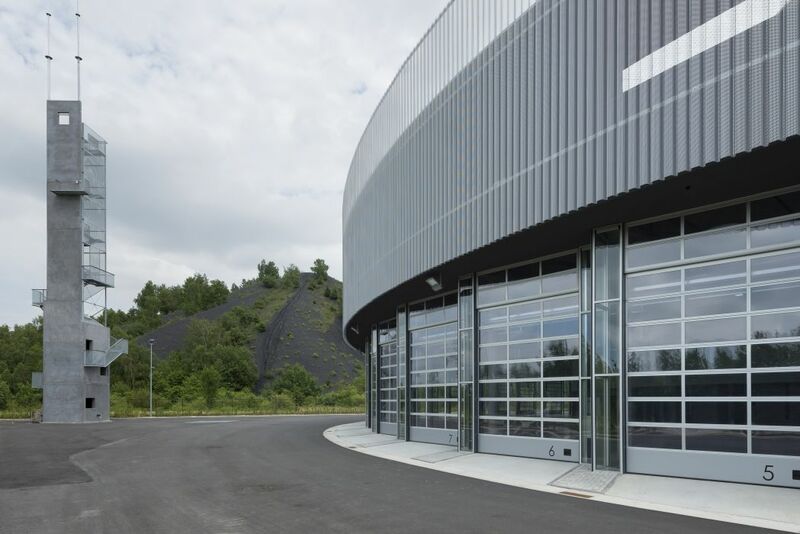 This level is surrounded by an emergency ring road, allowing each truck to leave independently from the others by a sectional door assigned to it. 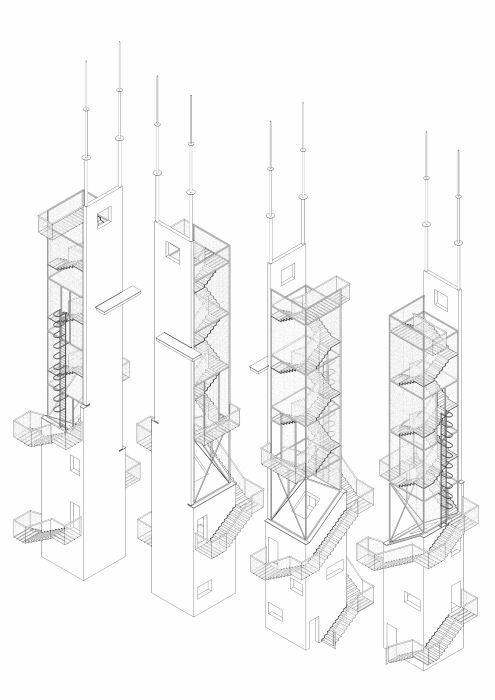 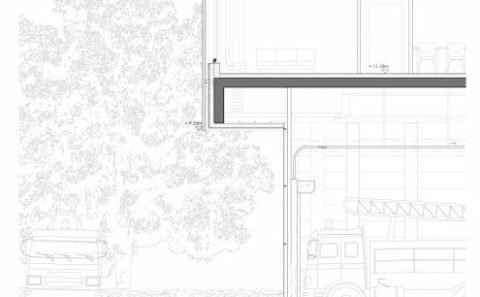 The true backbone of the project is the north-south axis, naturally indicated by the access to ground level. 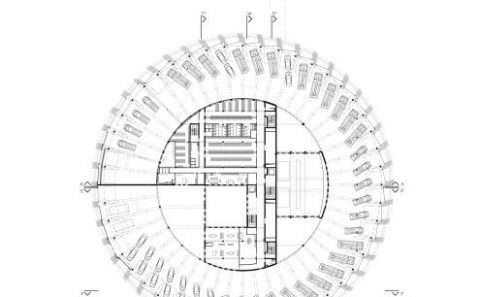 This is the main horizontal circulation, punctuated by all the vertical circulations, thus defining the building’s orientation. 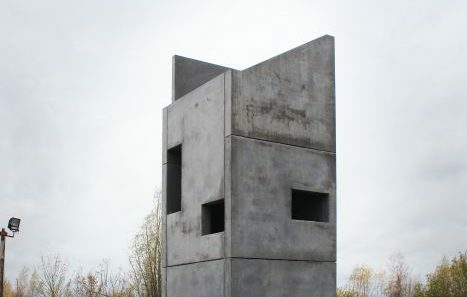 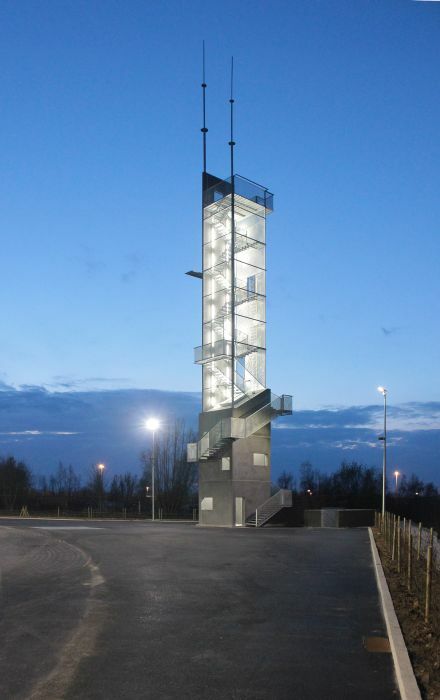 The drill tower, situated across the emergency road at the junction of the north-south axis and the emergency vehicle access road, is visible from this axis. 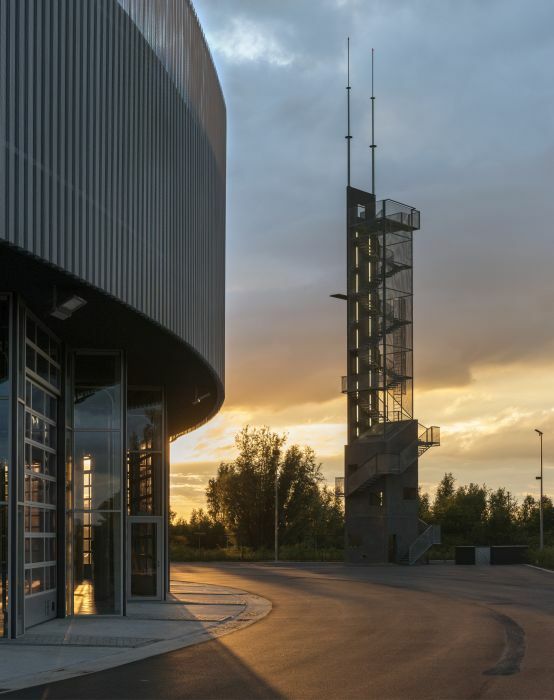 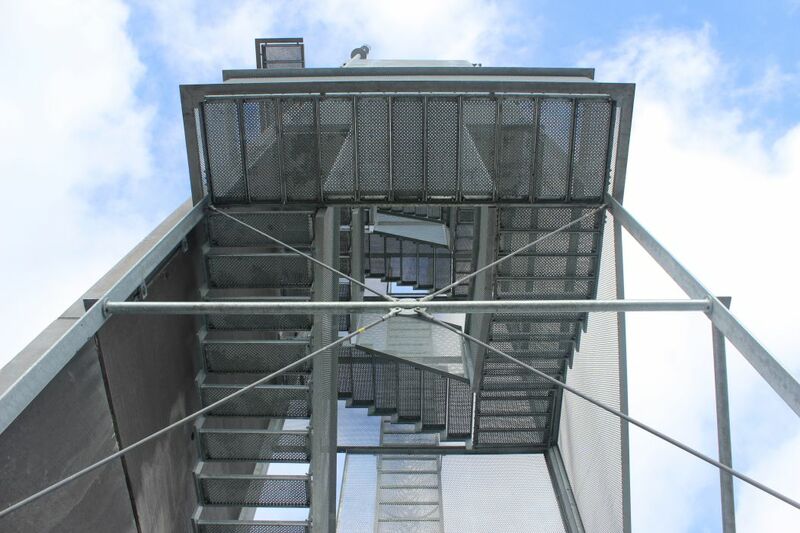 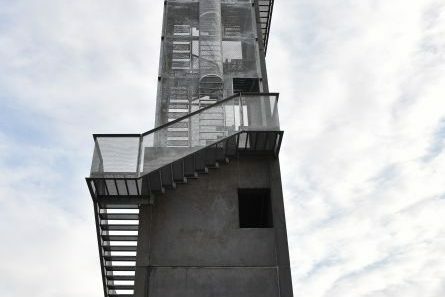 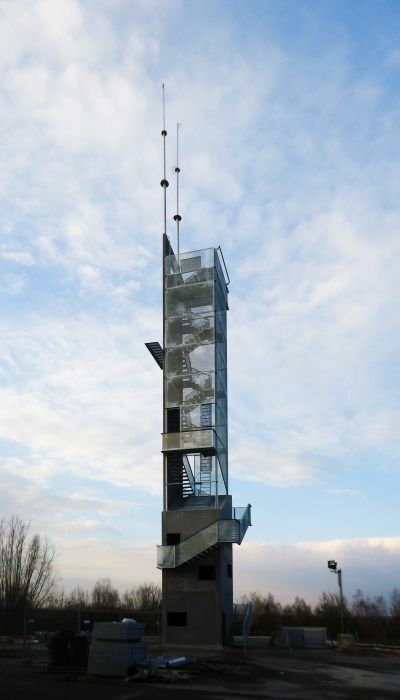 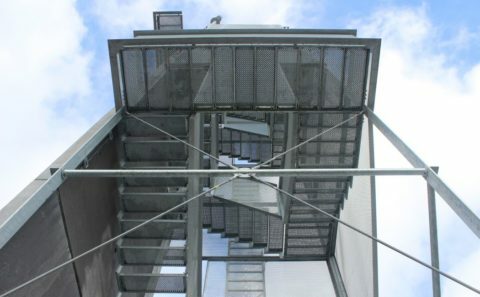 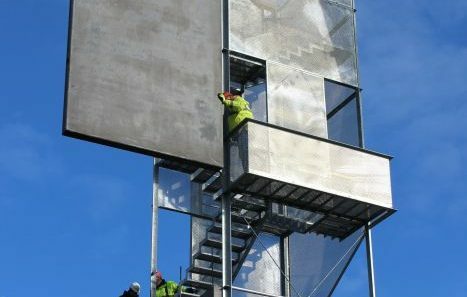 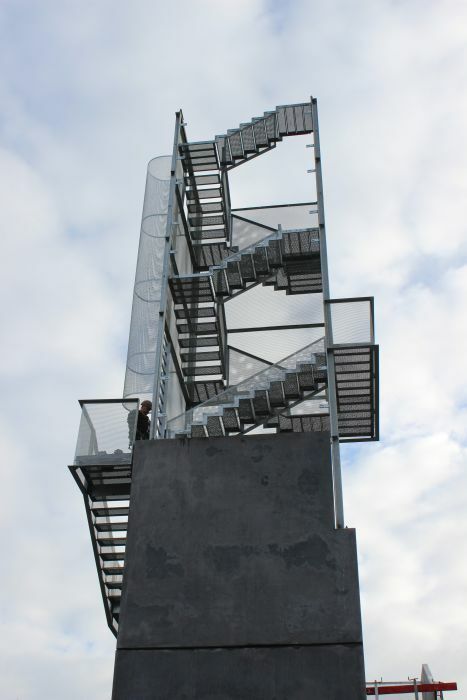 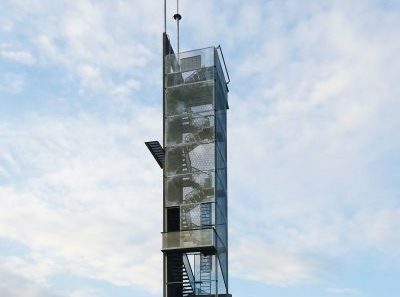 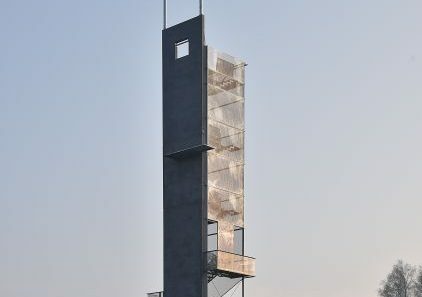 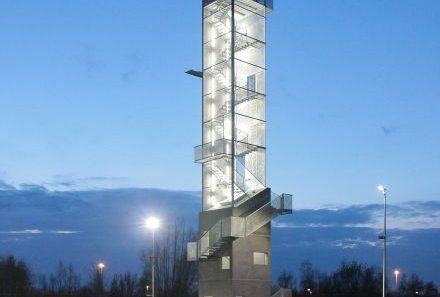 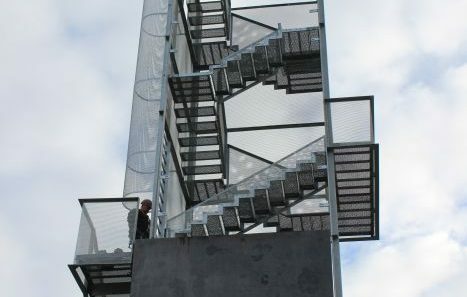 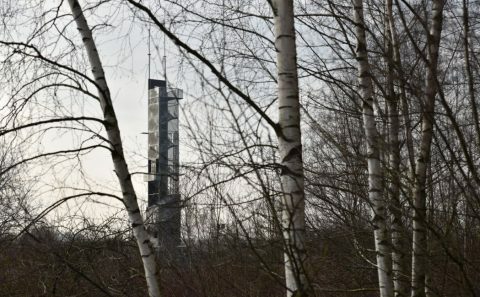 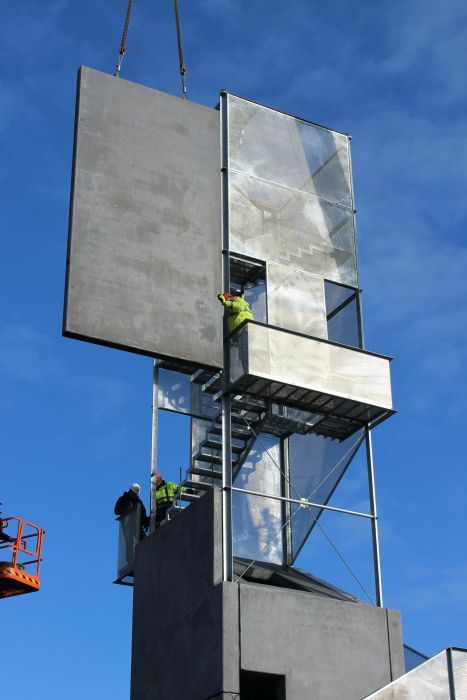 At 25 m tall, this particularly sleek tower uses the perforated sheet metal of its facade cladding as structural bracing. 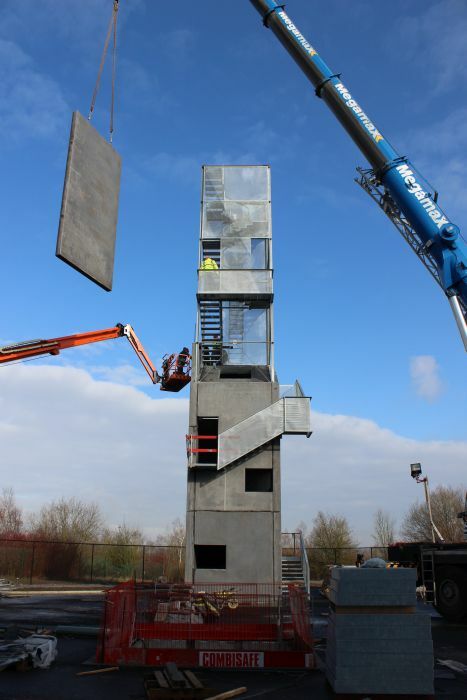 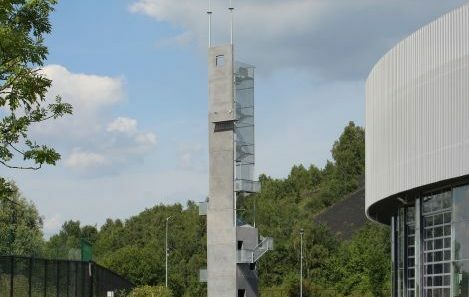 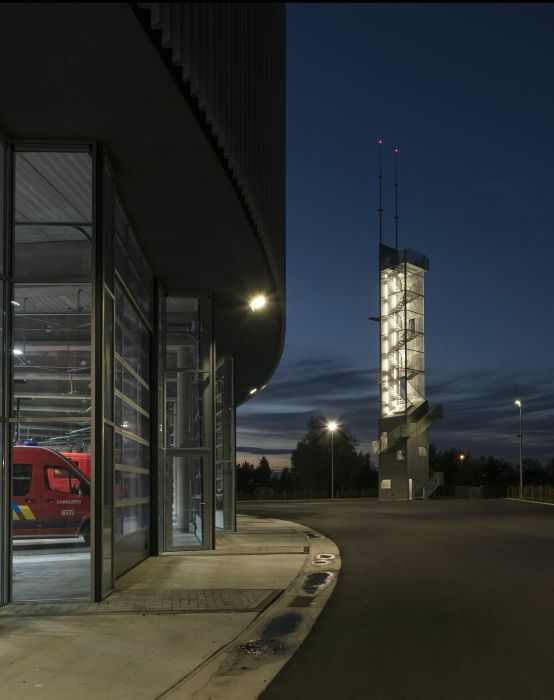 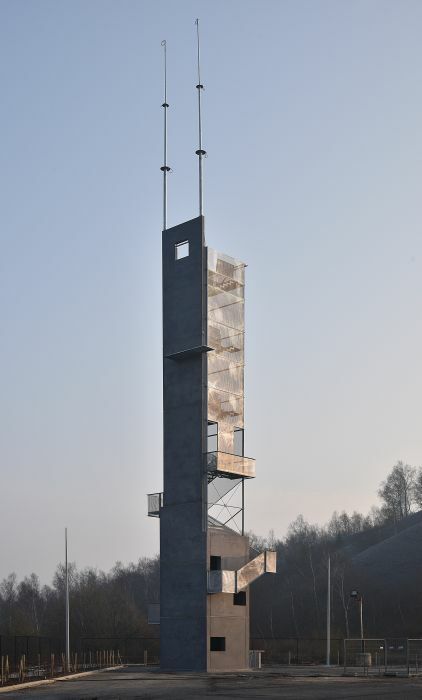 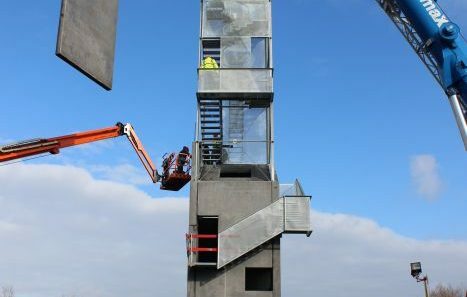 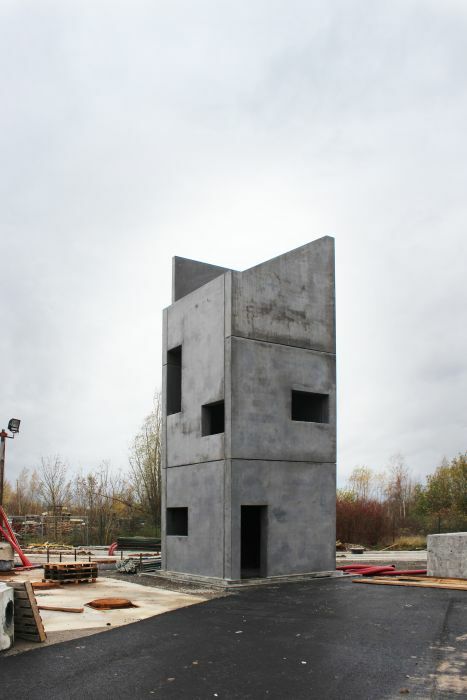 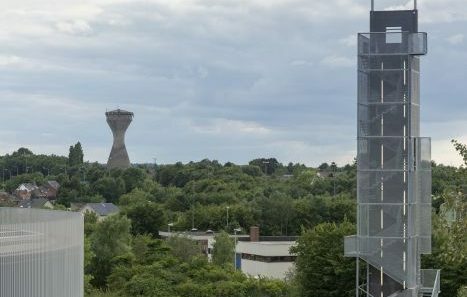 It is surrounded by a concrete exercise area to the north, allowing trucks to easily turn around the tower and to simulate fires. 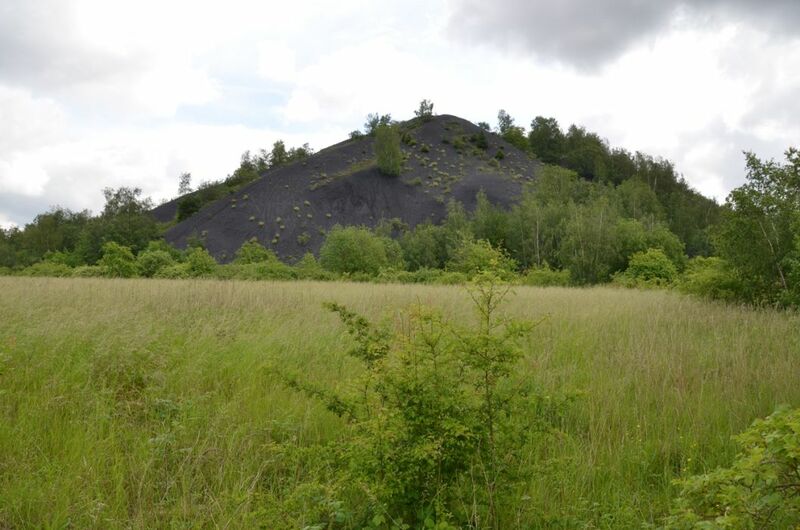 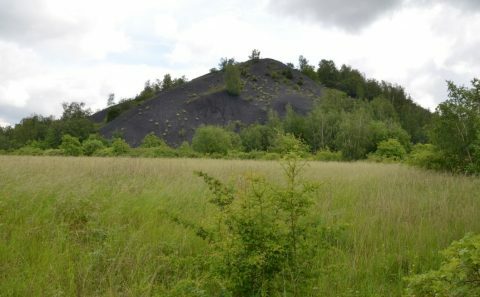 The site report suggests establishing the area for fire drill exercises to the north of the field, in order to avoid smoke drifting toward the neighbouring houses. The south-east area follows the uneven ground in order to limit, as much as possible, the construction footprint on this green site. 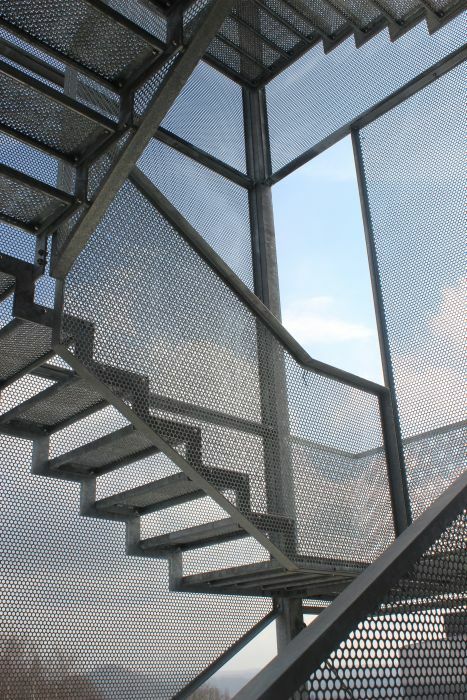 It naturally joins the outdoor sports field, established as a continuation of the delivery area. 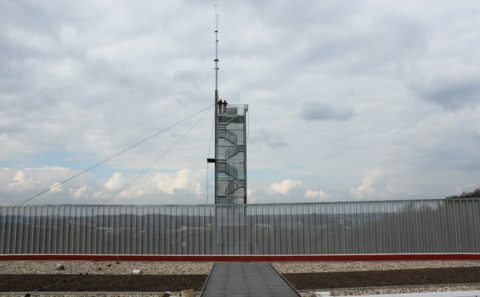 The site is fully secure, thanks to a continuous barrier, with only two separate and secure access points: the “emergency” west access point at level 1, and the south access point for the public and the deliveries at level 0. 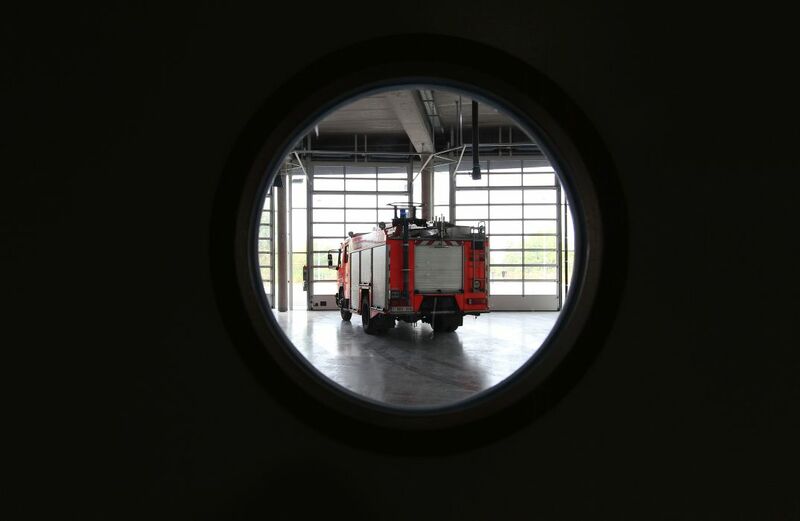 The round form of the plan issues directly from the flow of emergency vehicles. 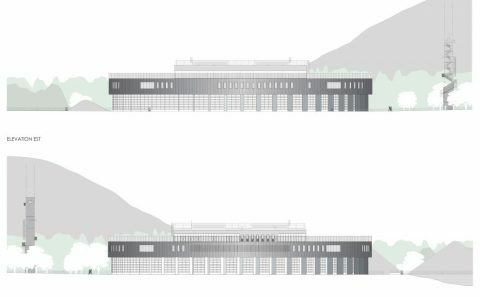 Indeed, two circulation driveways are planned: the first, internal, for return from emergencies and the other, external, for departures. 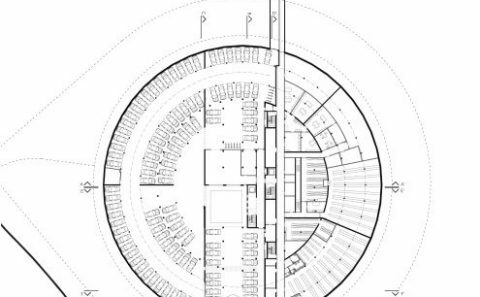 The round form is an obvious means to avoid any crossing between the two flows and to ensure that no manoeuvre is performed both inside or outside the great hall. 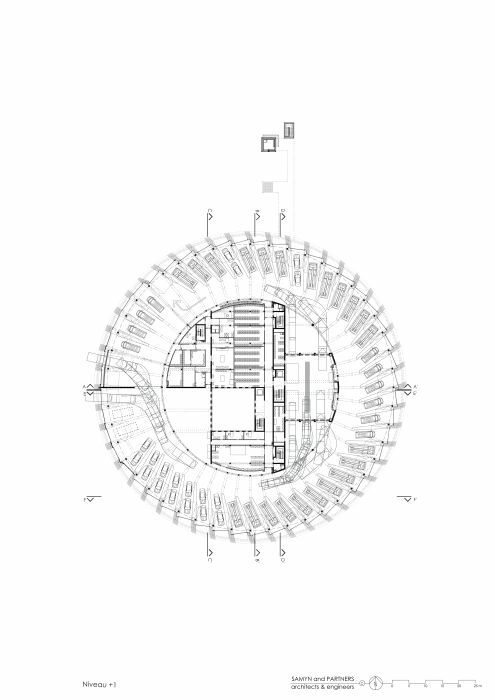 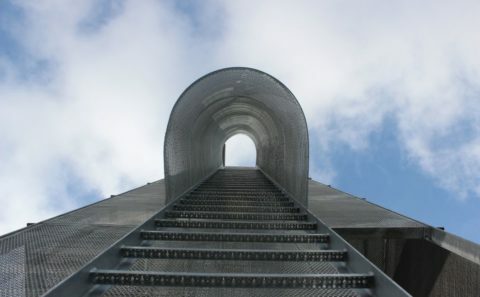 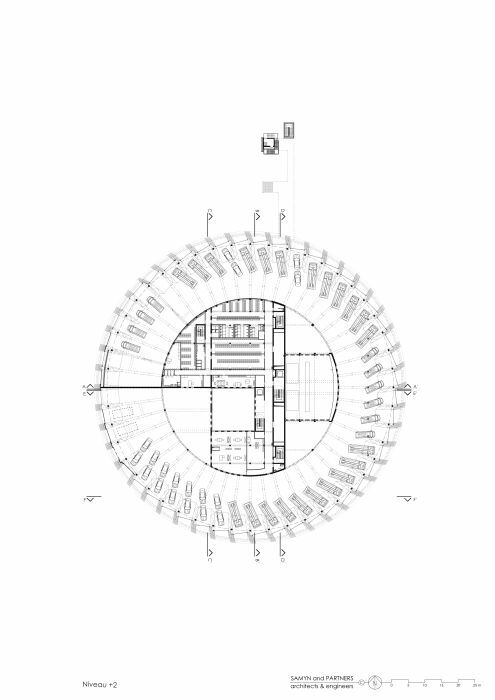 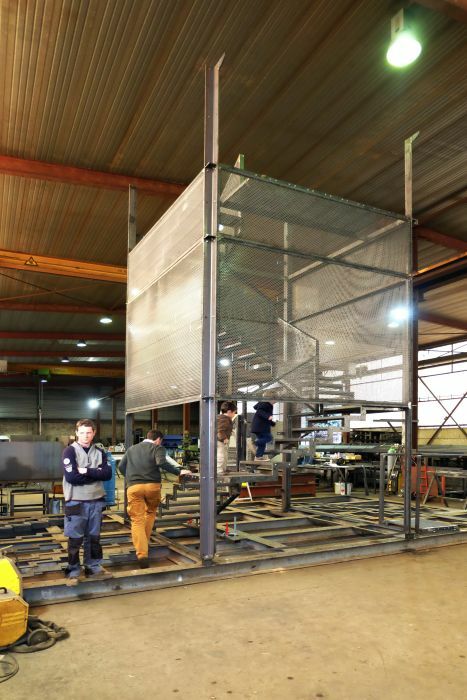 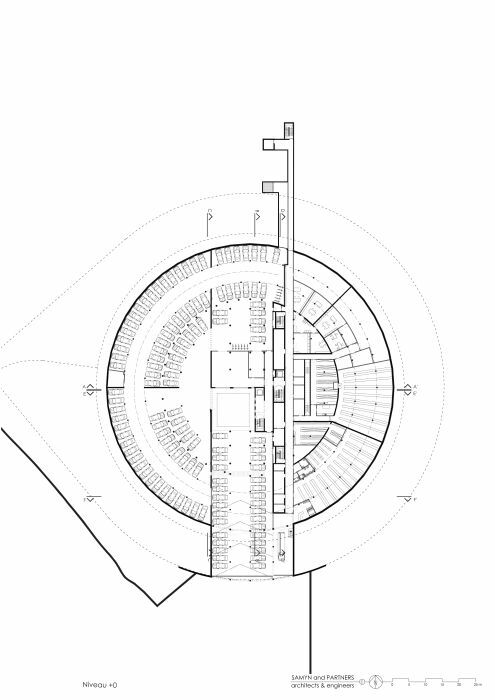 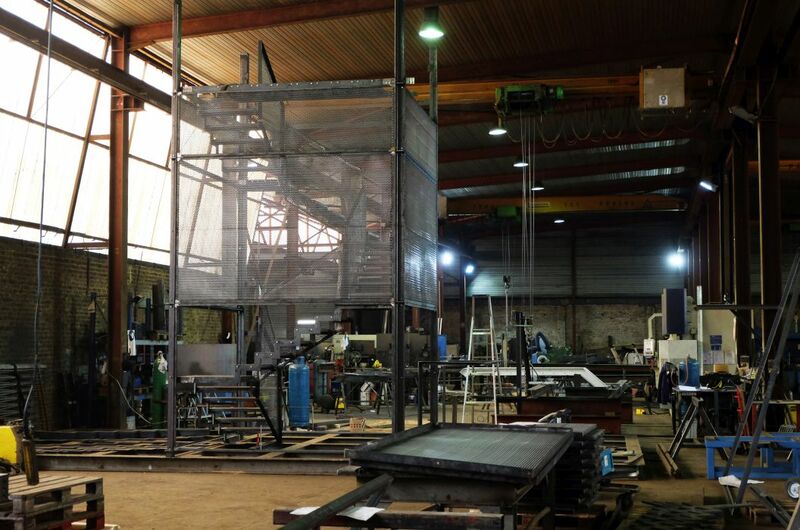 All functions are housed in this 90 m diameter and 5 level high cylinder. 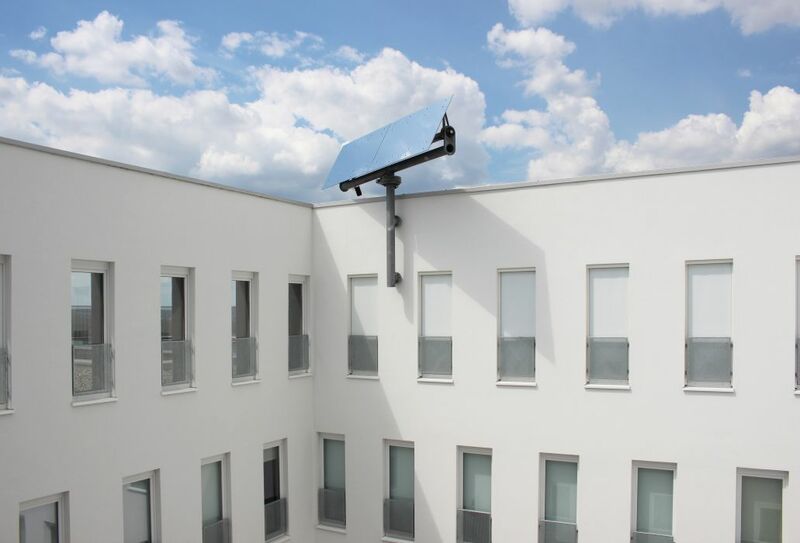 The compactness of this volume reduces external exposed surfaces and thus minimizes energy loss. 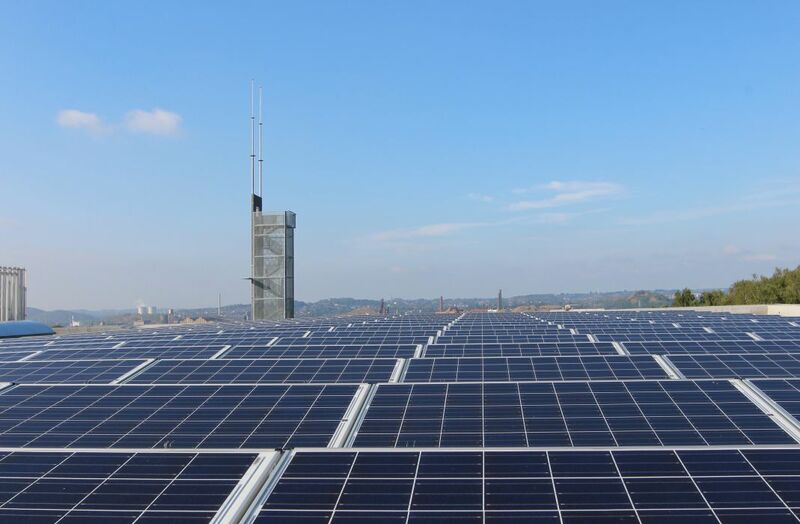 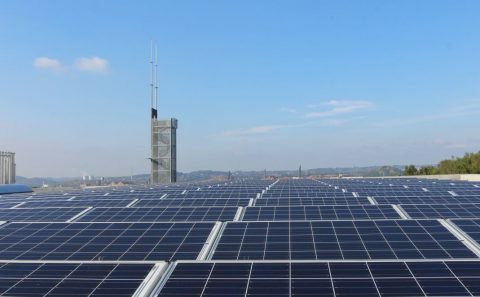 Before putting renewable energy systems in place, it is essential to save energy at the source, reducing energy loss and maximising free gains from the architecture and its positioning on the site. 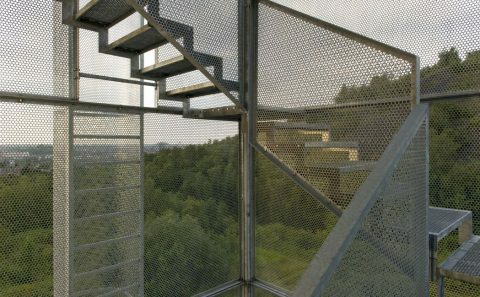 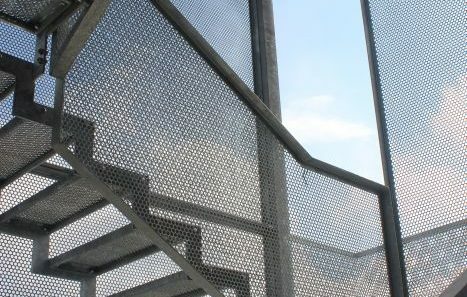 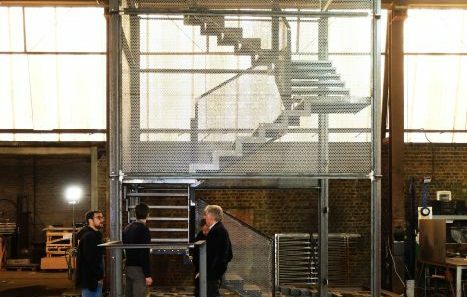 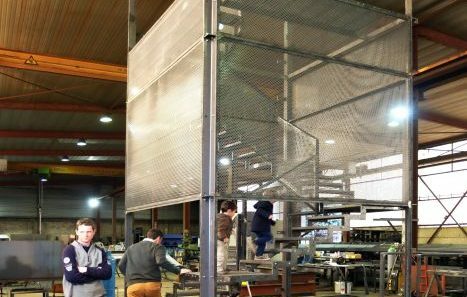 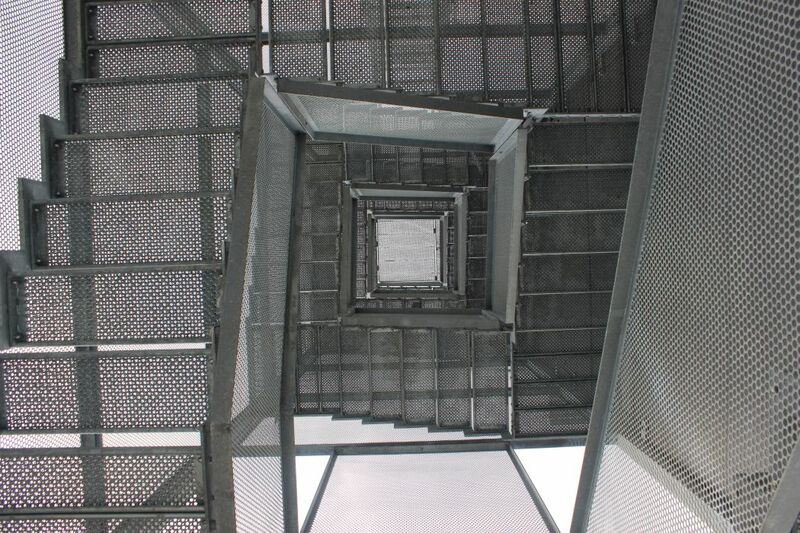 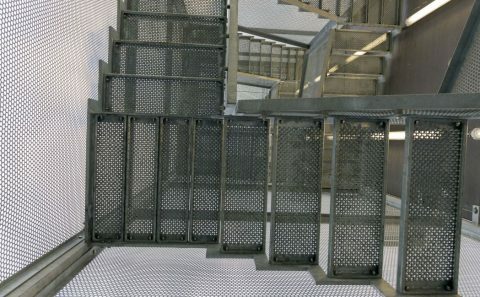 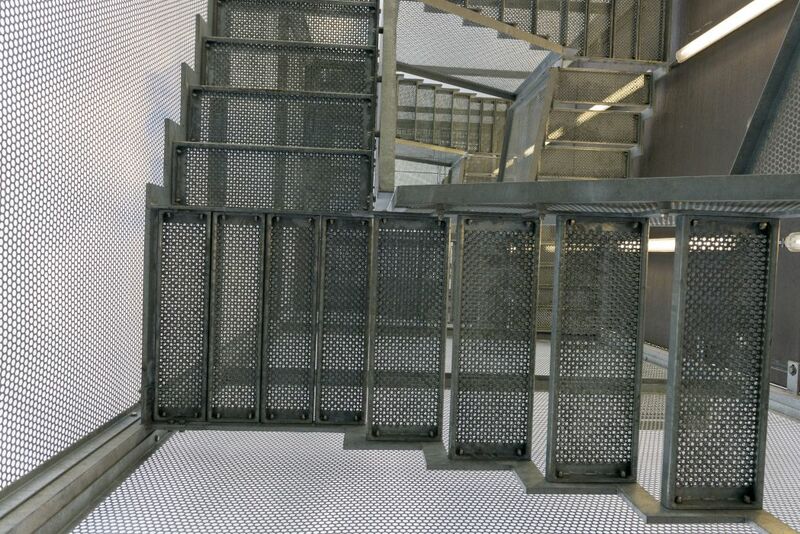 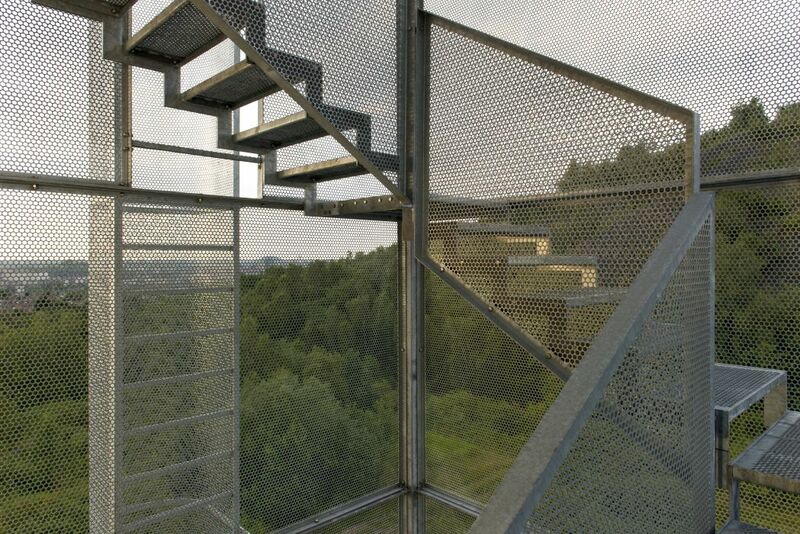 Sleek, perforated sheet metal in galvanised steel forms a vertical screen that encircles the building. 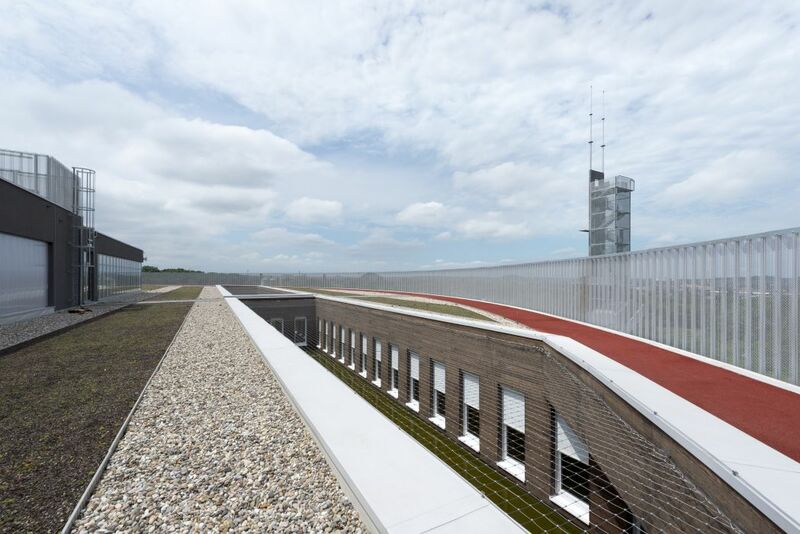 It protects the curved facade from the sun, and, in the form of railings, extends onto the roof terrace beside the bordering athletic track. 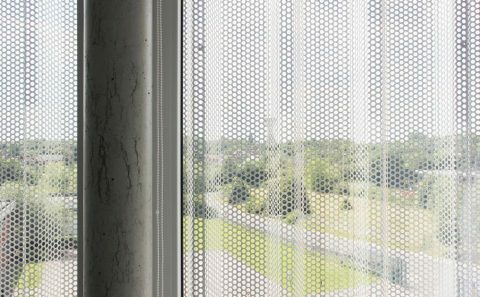 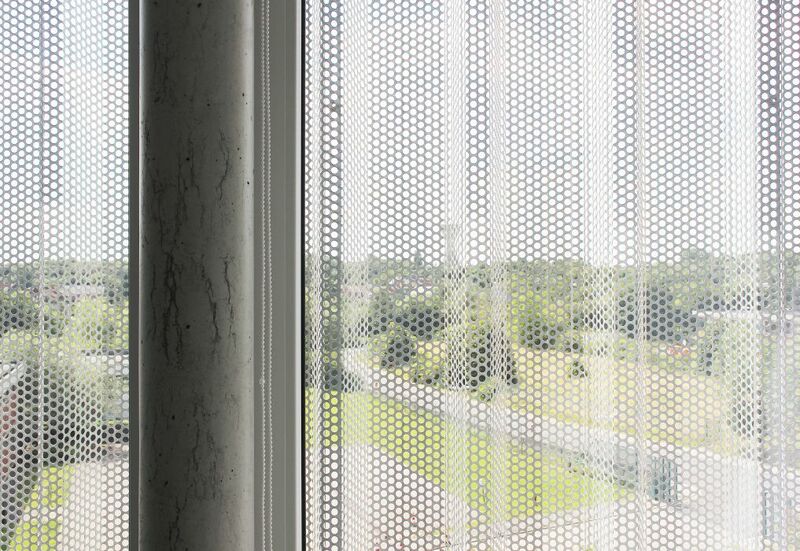 Its perforation rate of 51% makes it virtually transparent from inside. 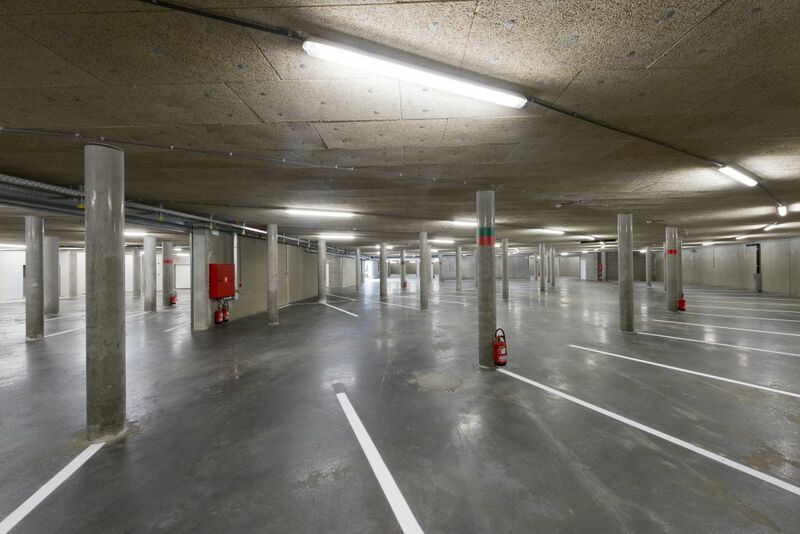 This semi-underground level is on the same level as the south access. 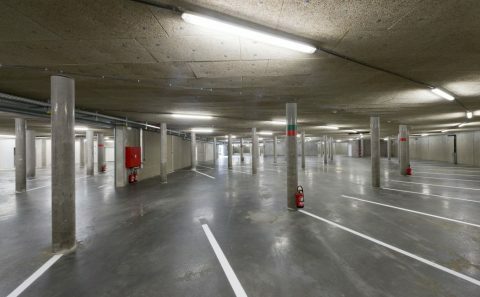 It is ideal for parking and for the delivery area. 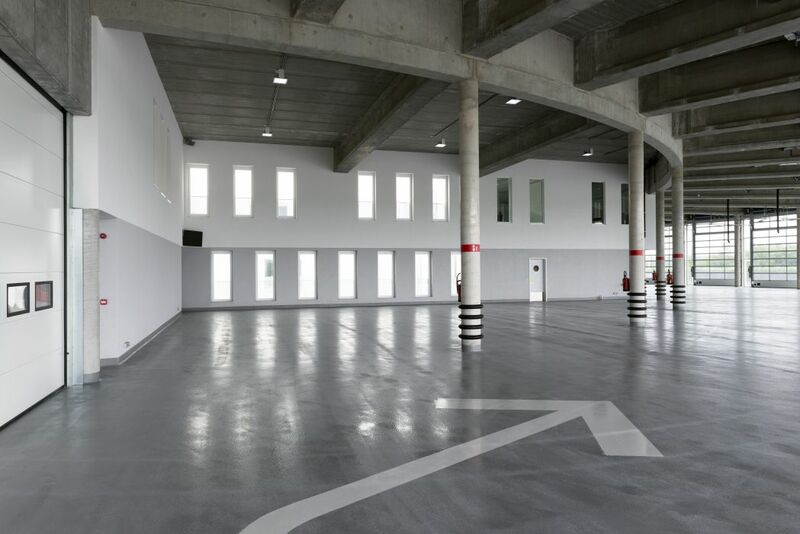 All the car parks, as well as the unloading platform, are covered. 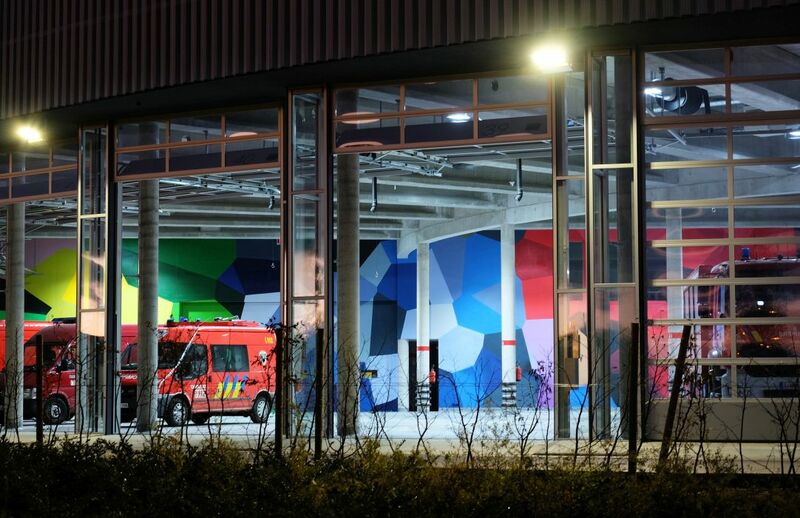 The car park is clearly divided between visitors, day personnel and “24 h” personnel. 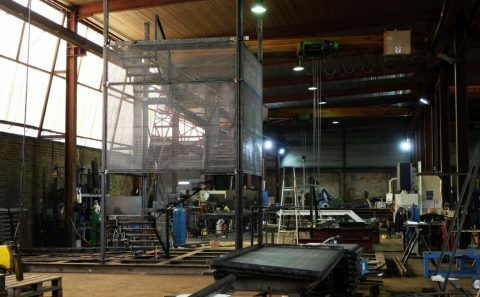 The rest of this level is composed of technical areas, stock areas (directly connected to the unloading platform) and areas for special units. 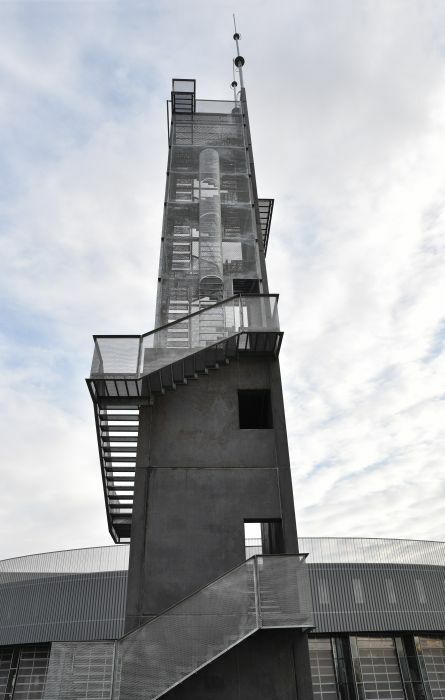 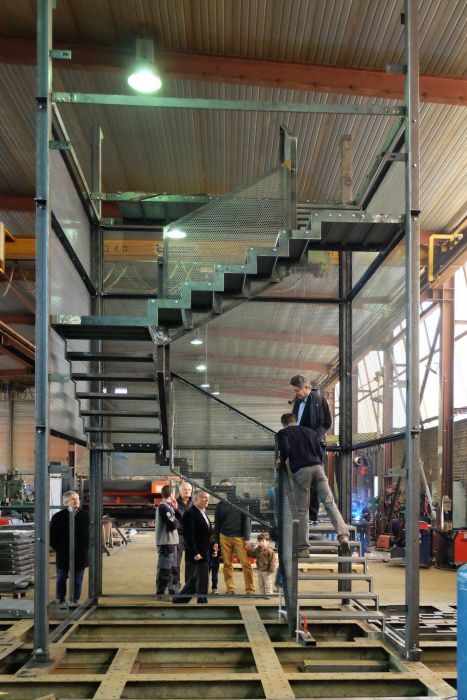 In addition, there is a gas mask training pathway and an access to the drill tower. 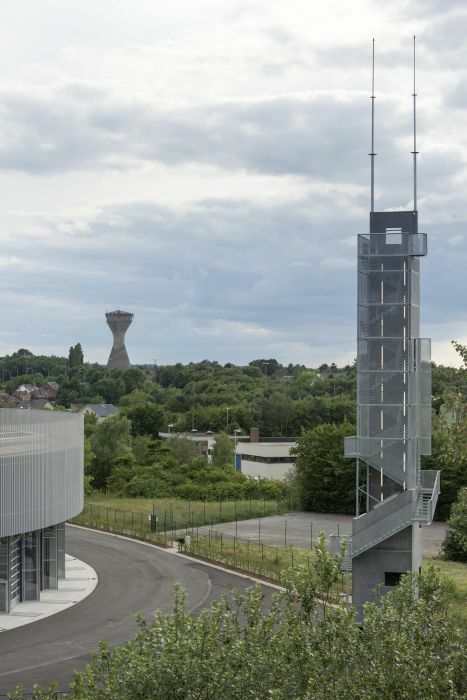 As it is sheltered from inclement weather, the use of the car park is very comfortable while its reduced footprint maximises external green spaces. 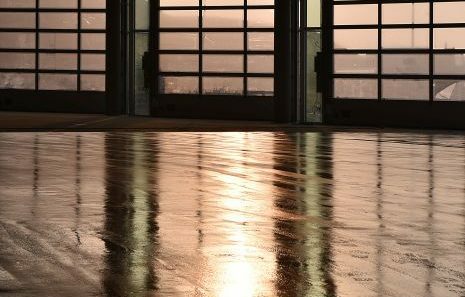 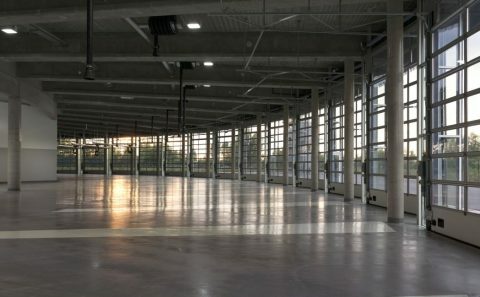 The natural light in the car park further increases comfort with a set of mirrors reflecting the light from the central skylight. 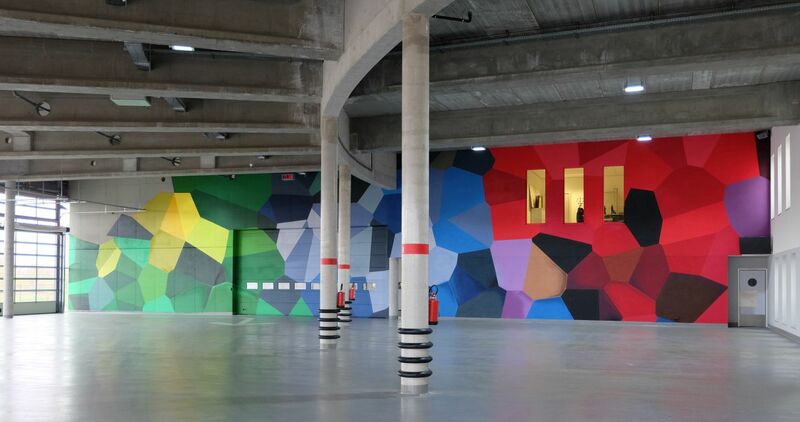 This brightens the space and makes the entrance clearer. 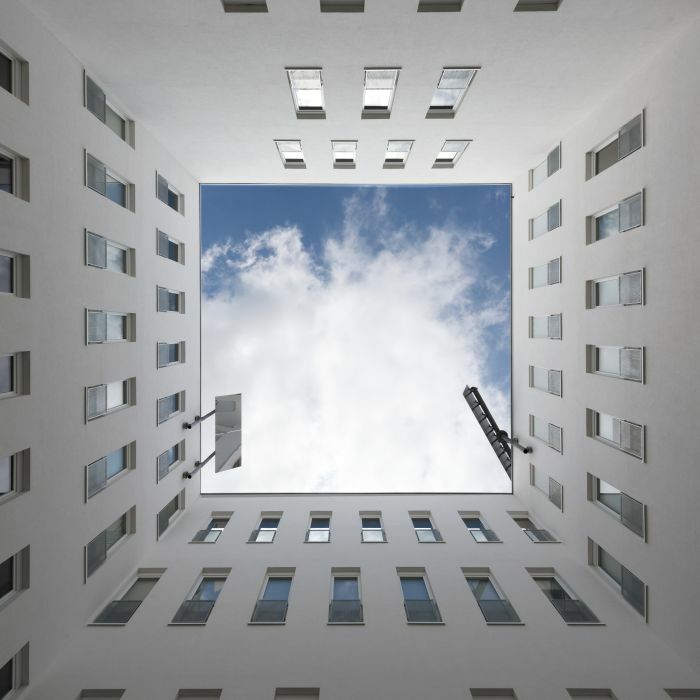 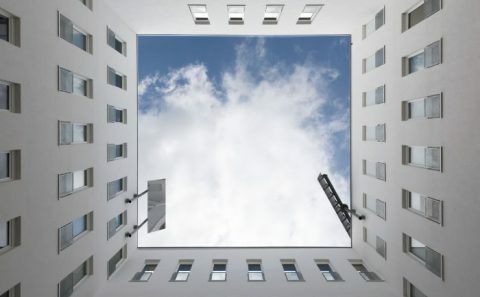 Indeed, this 13 m squared skylight is situated next to the vertical circulation core and the welcome-museum area. It naturally guides all users to this space. 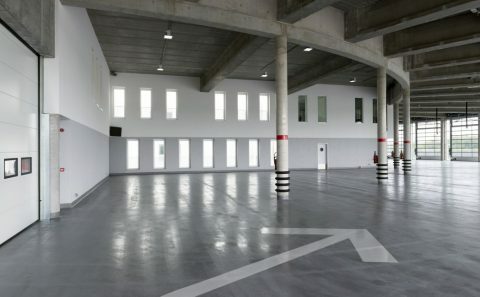 At the level of the west access, this area is occupied on the periphery by the main hall, harbouring the vehicles’ garage in addition to an internal lane. 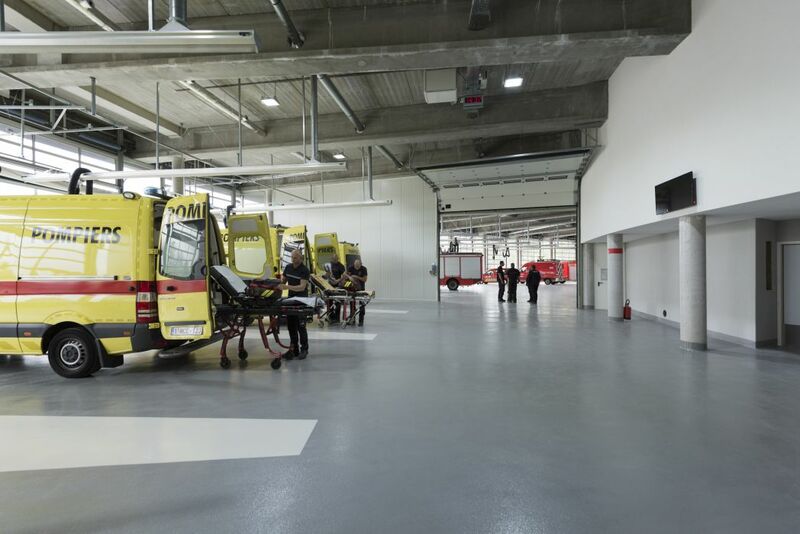 A separate compartment houses the ambulances at a constant temperature, while another compartment is occupied by a car-wash. 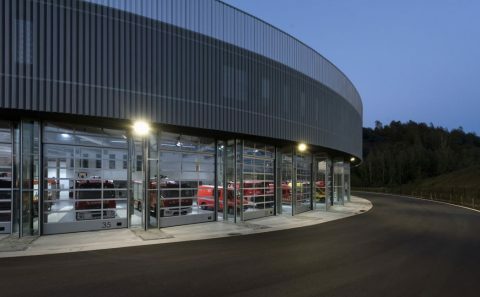 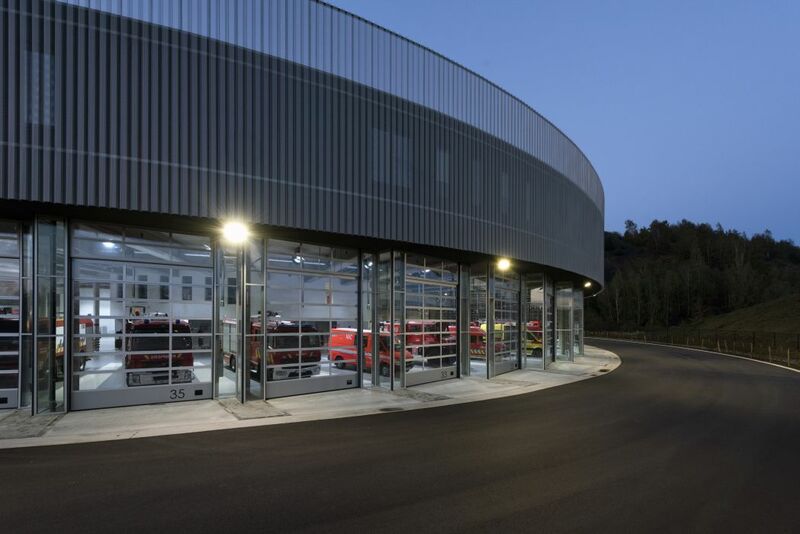 There are no pillars between the circulation driveway and parking places, which prevents many potential accidents and provides flexibility in this annular space. 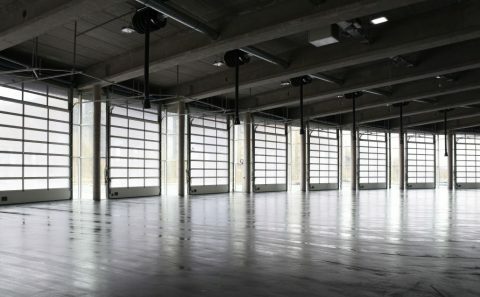 However, no vehicle is to circulate in an emergency state within the building. 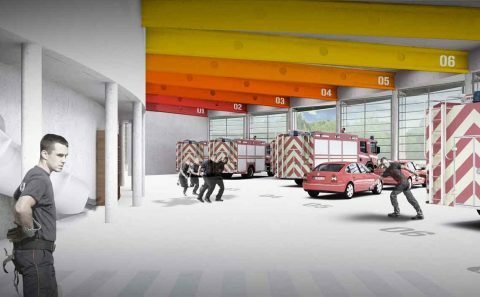 In fact, each vehicle has its own door and leaves directly without endangering any of the fire fighters who are running towards their trucks. 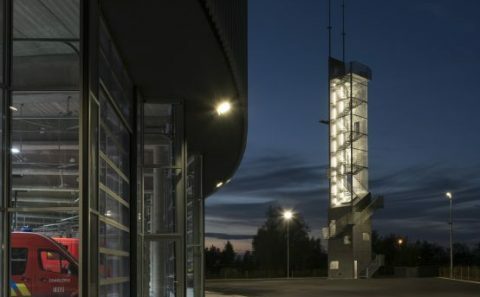 The main hall is lit by forty-eight 6 m high translucent doors along the whole curved façade, creating soft and uniform lighting in addition to the skylight facing the back of the emergency area. 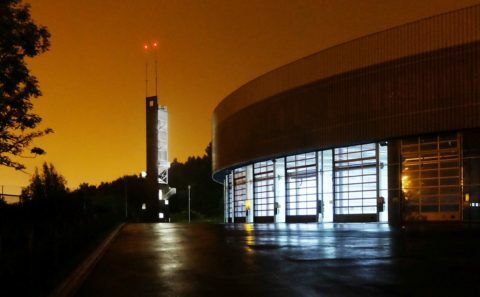 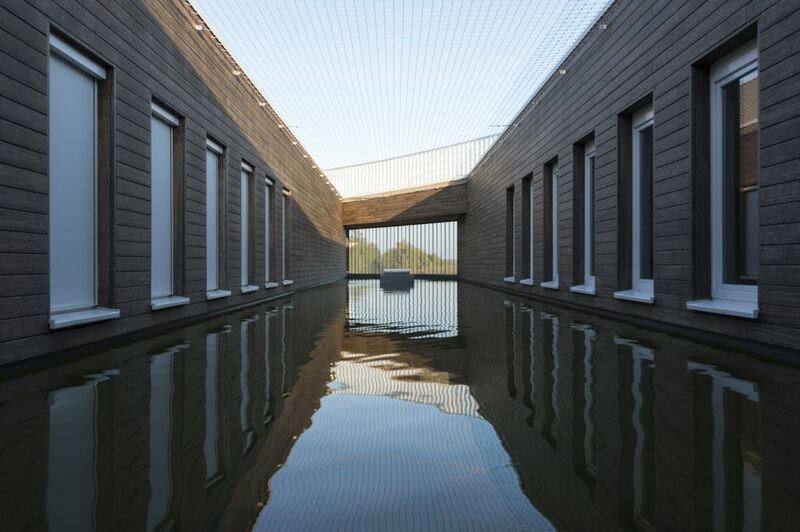 This special place is used by the fire fighters for celebration or contemplation when returning from a fire. 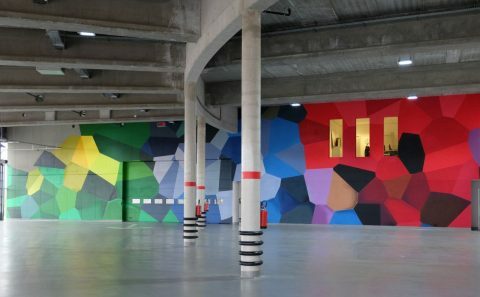 Called “Heroes’ square”, it is given a strong identity by the large, multi-coloured fresco, signed by the graffiti artist, STIX71, which borders its northern wall, and is in sharp contrast with the neutral atmosphere of the vehicle hall. 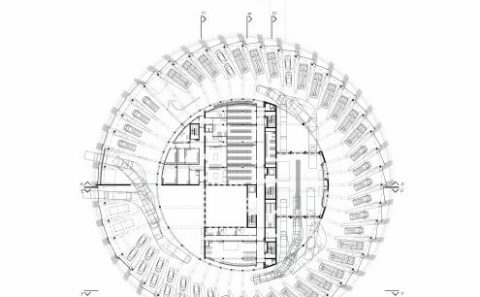 It also allows for the welcoming of groups of visitors, information sessions for the entire station, etc. 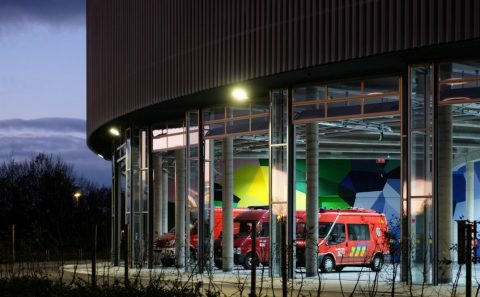 The composer, Pierre Bartholomée has also written a hymn for the fire fighters at Charleroi, “music worthy of their courage and their dedication, music that unites them during emotional times and which, with simplicity, celebrates the magnitude of their vocation.” The rest of the level, falling within the internal ring lane, includes the mechanical workshop, emergency changing rooms, storage and maintenance rooms for equipment and truck (masks, tanks, hosepipes, etc.). 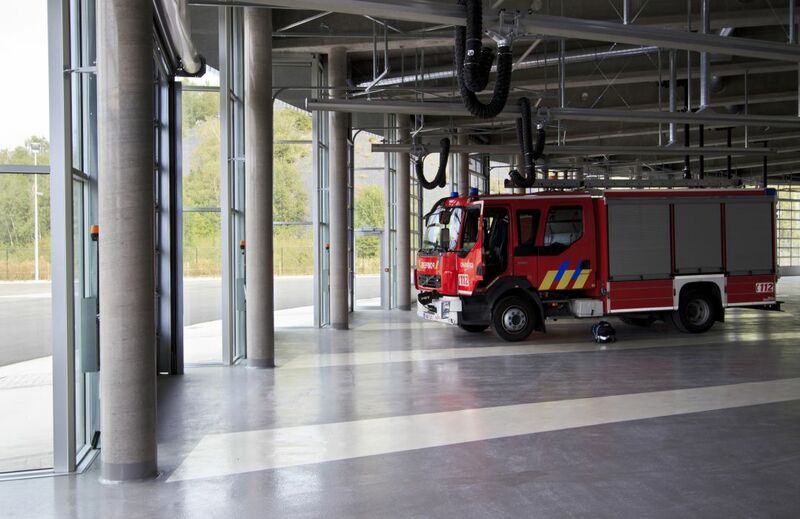 A logical pathway connects contaminated elements, near to the back of the emergency area, and the clean elements on the side of the first emergency trucks. 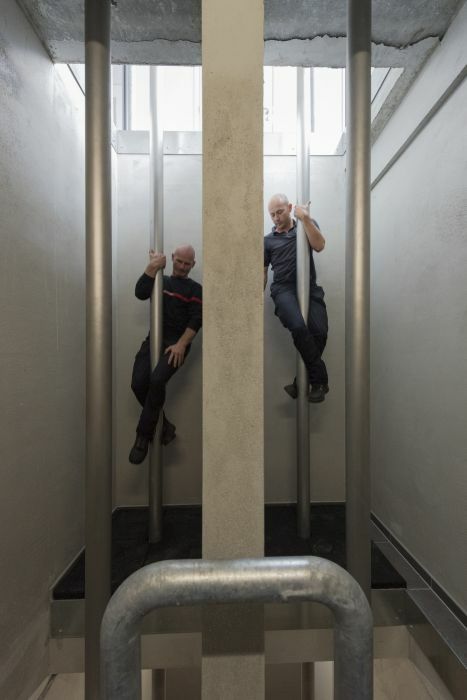 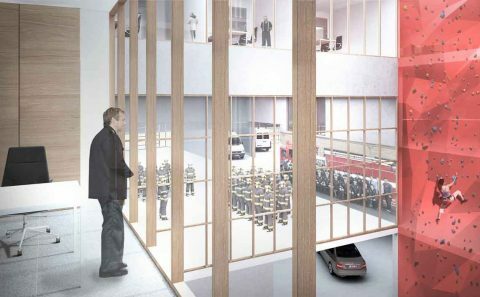 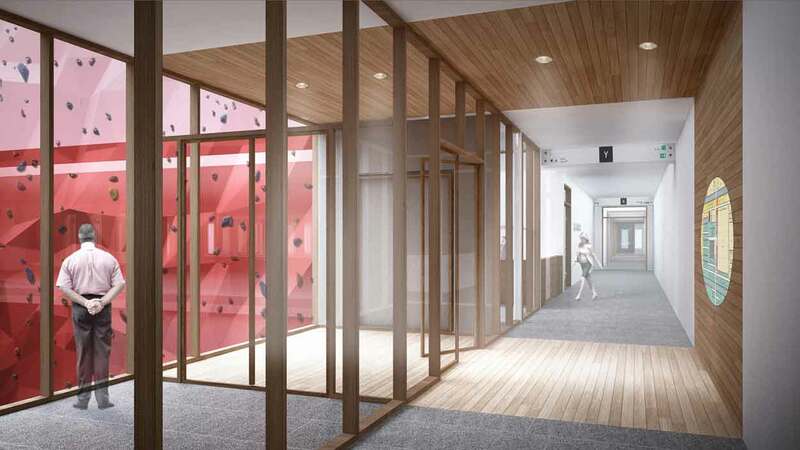 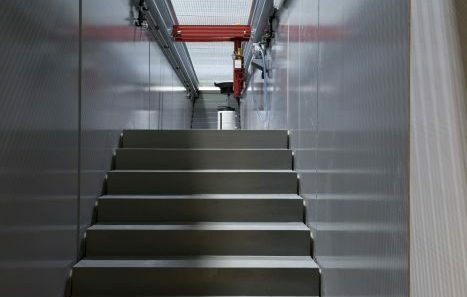 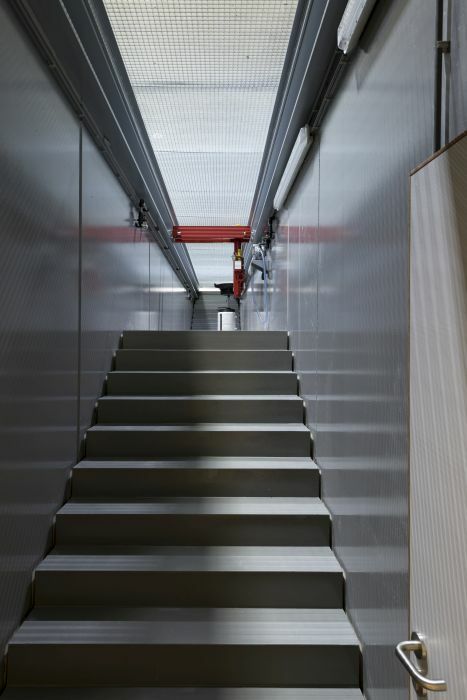 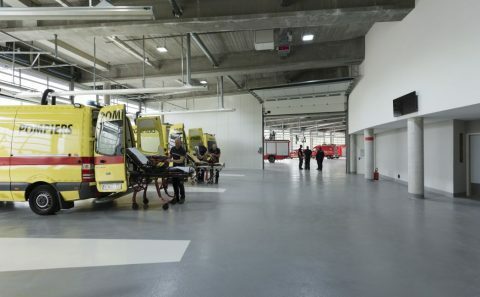 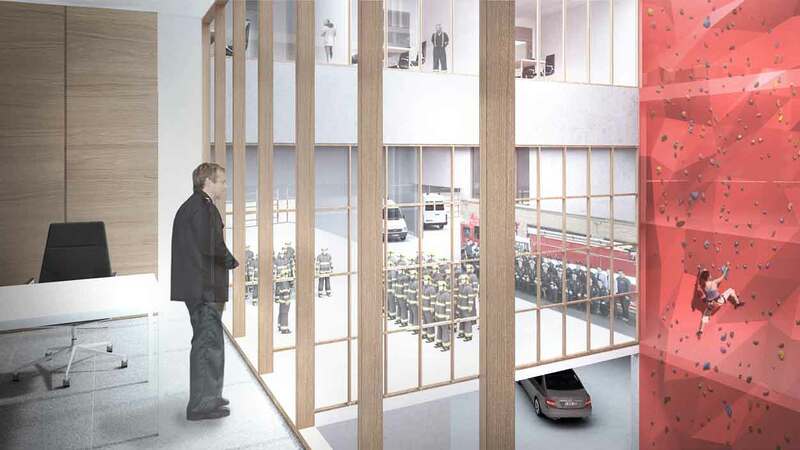 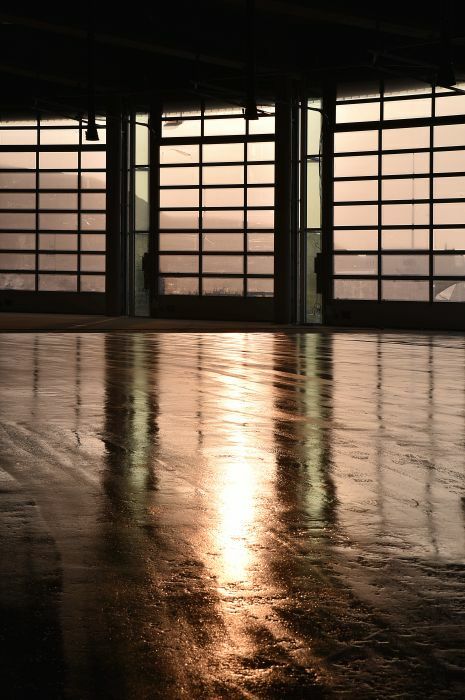 On the mezzanine of the main hall and the workshop, this small-surfaced area includes private changing rooms, rooms dedicated to the ambulance drivers in addition to some offices, using the light from the central skylight. 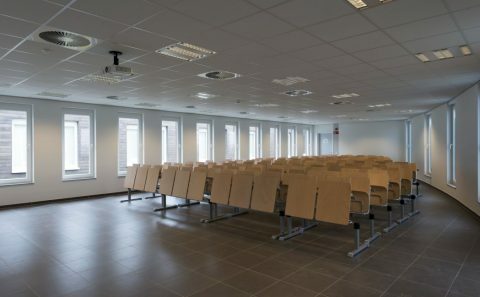 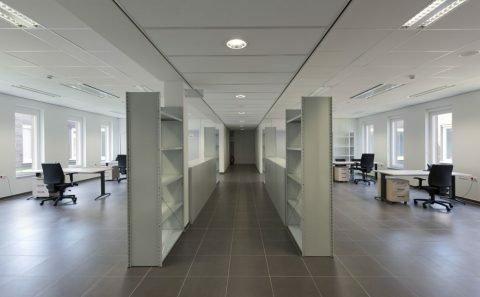 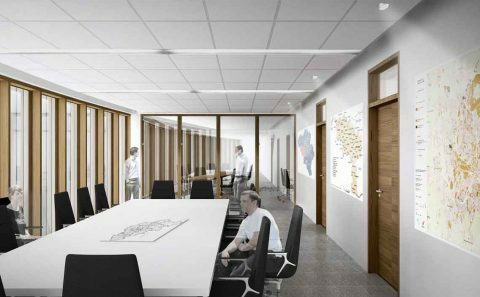 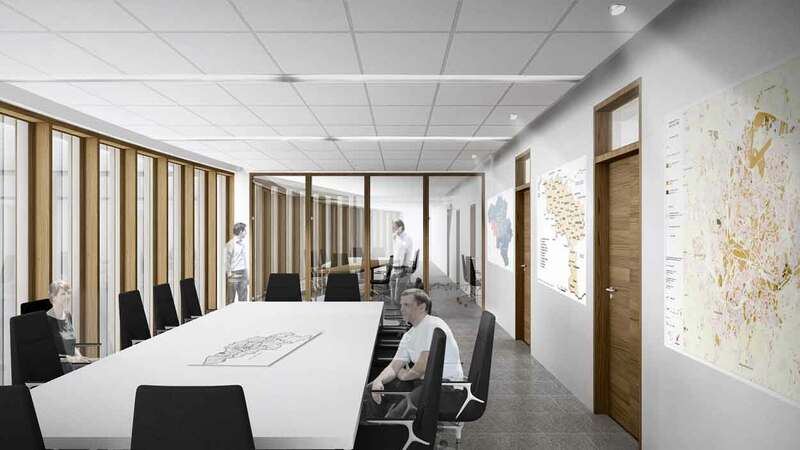 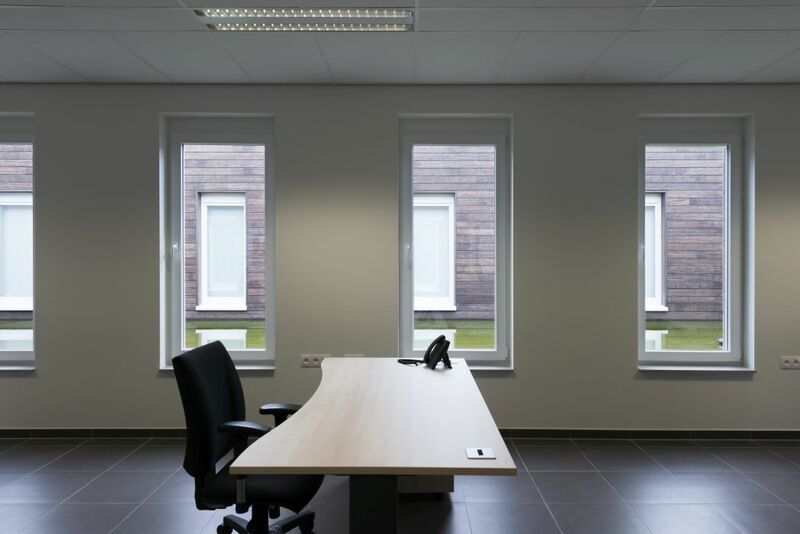 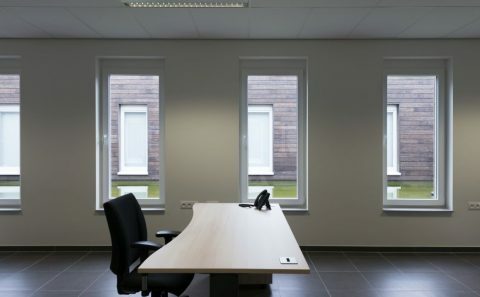 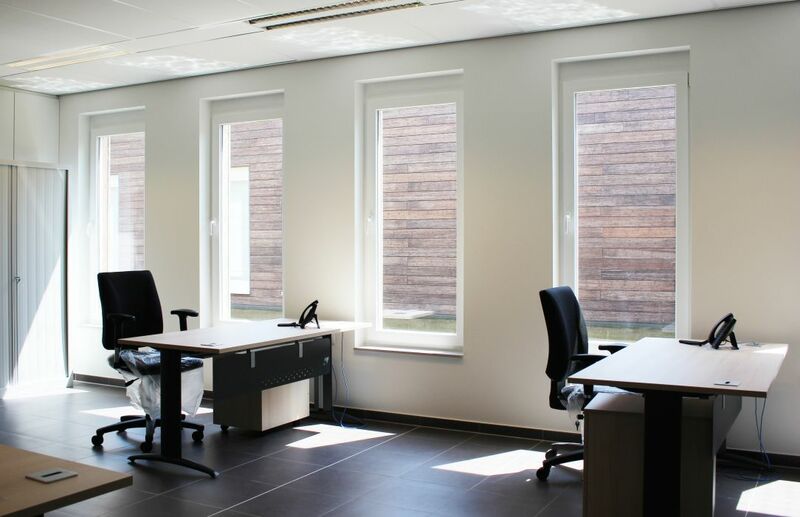 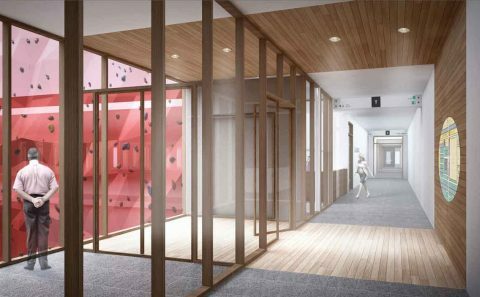 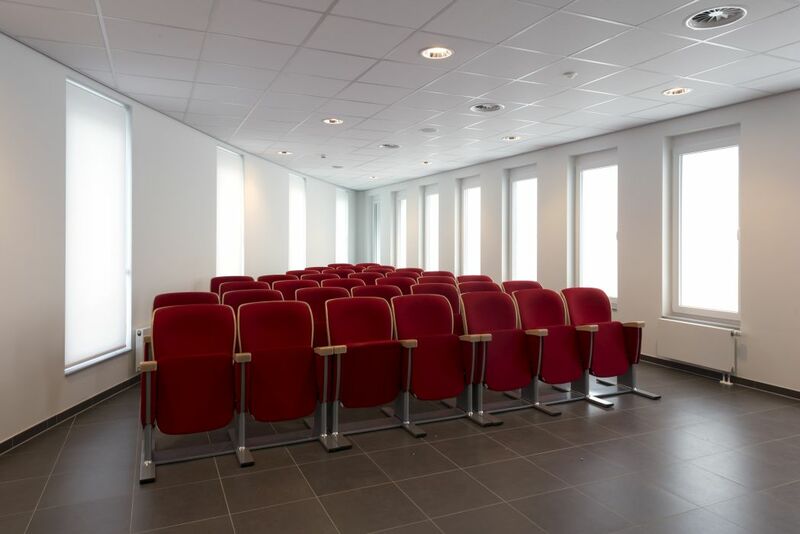 This level includes all departmental offices as well as the building’s general reception office situated next to the vertical circulation core. 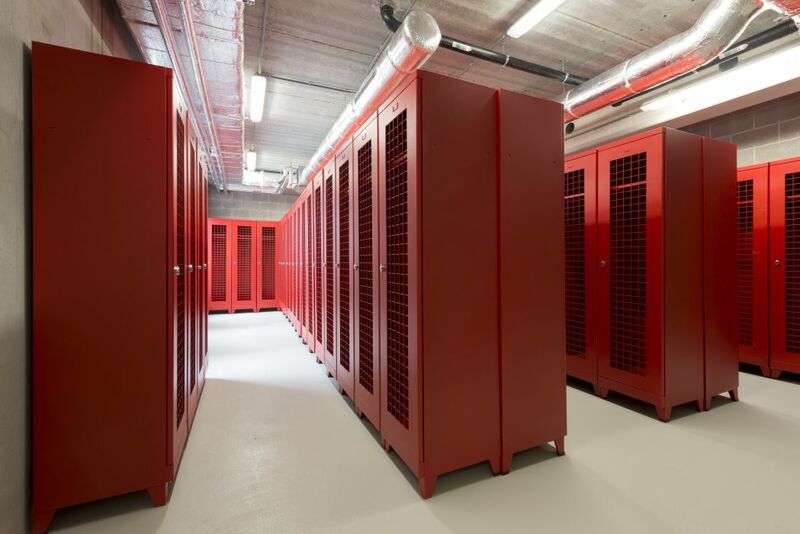 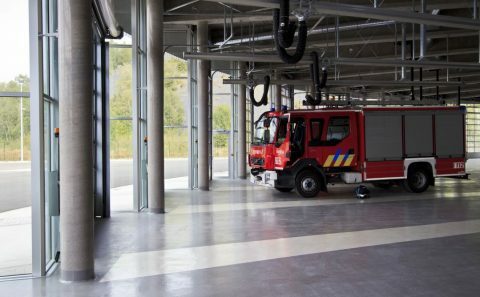 These departments are served by a central north-south corridor which, after the airlock, also serves the fire fighters’ living areas (television room, sports hall, training room, bedrooms etc.). 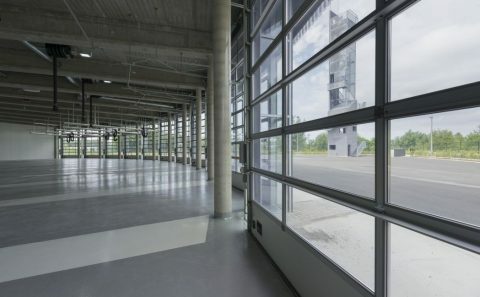 The Emergency Call Processing Centre, located near the bedrooms and offices, offers a panoramic view of the emergency driveway. 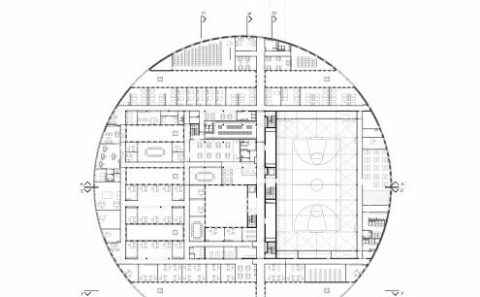 All of these areas are lighted by exterior wall openings as well as by 7 north-south oriented patios in addition to the central skylight. 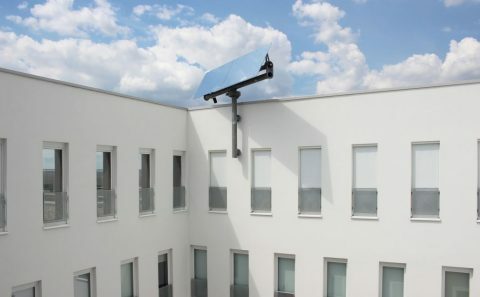 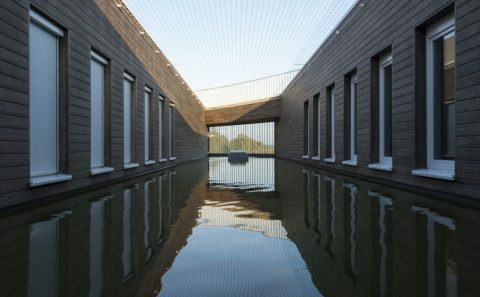 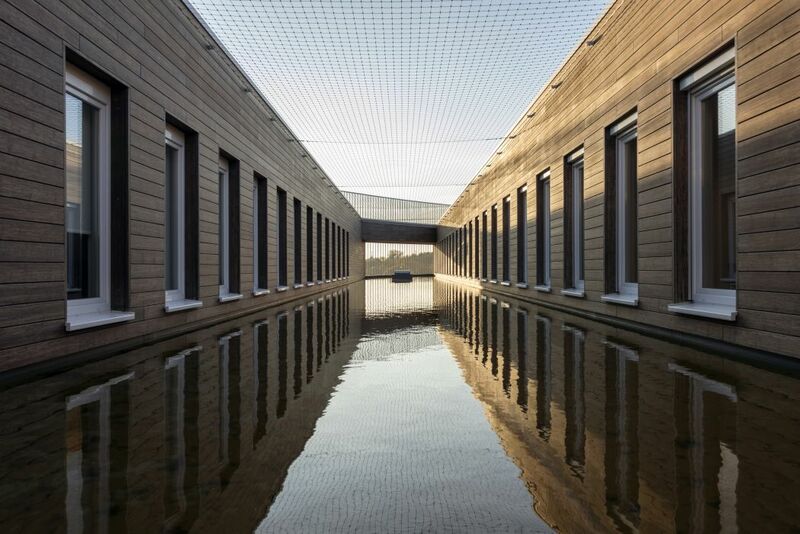 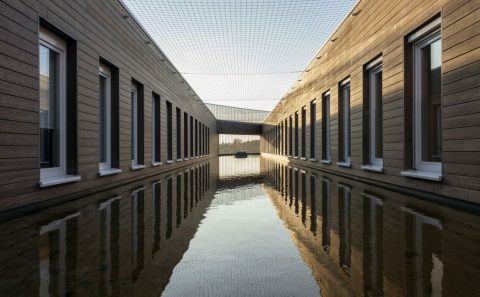 These north-south patios allow efficient energy management, improving hygro-thermal comfort with water pools. 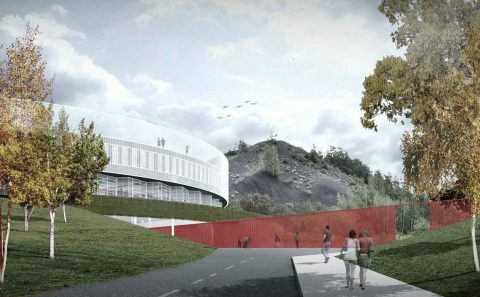 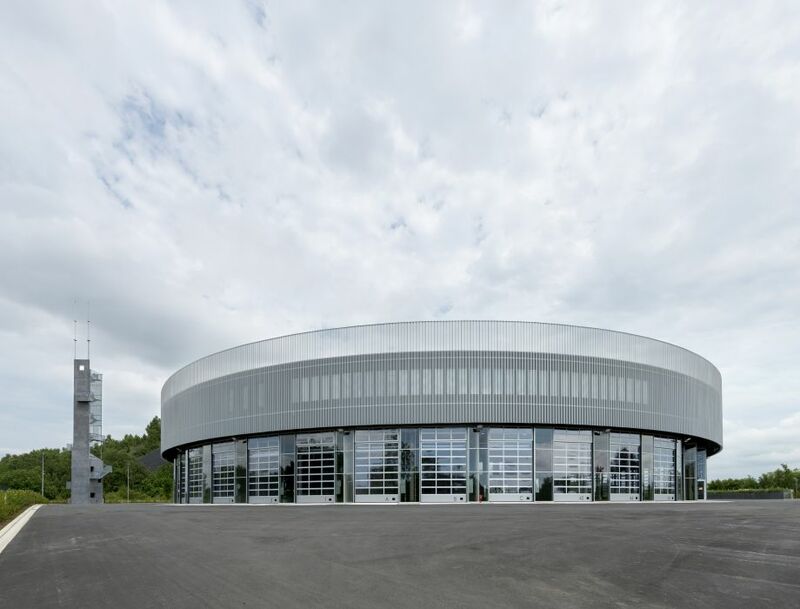 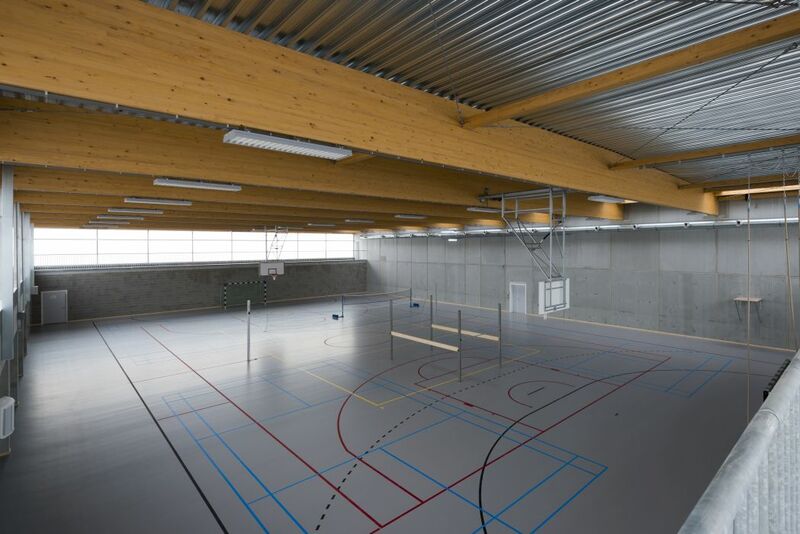 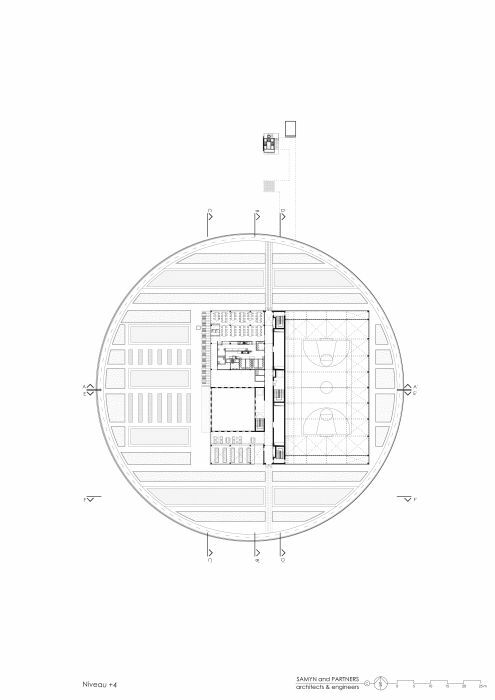 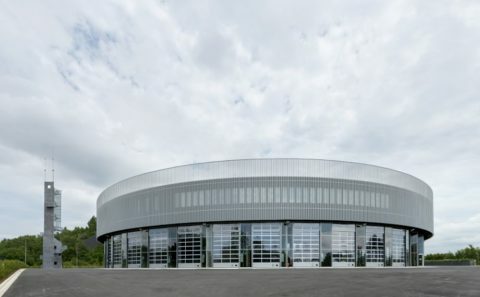 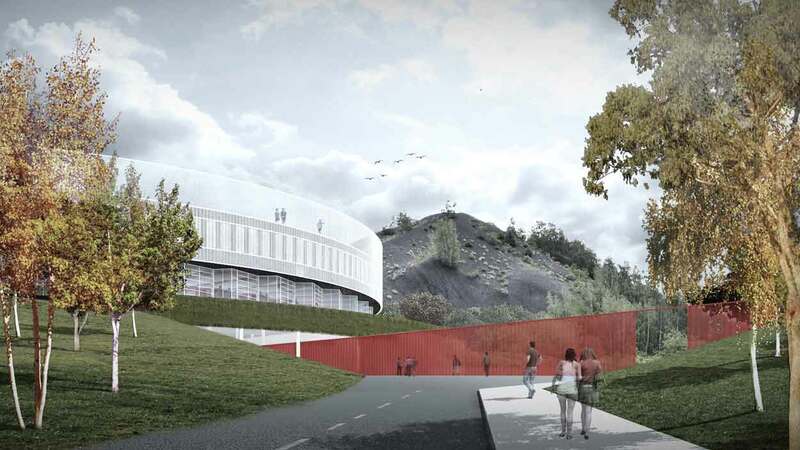 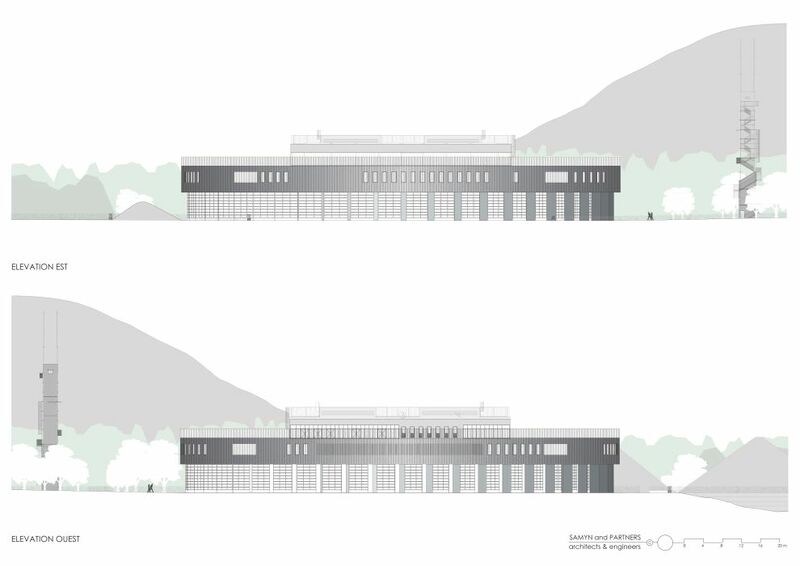 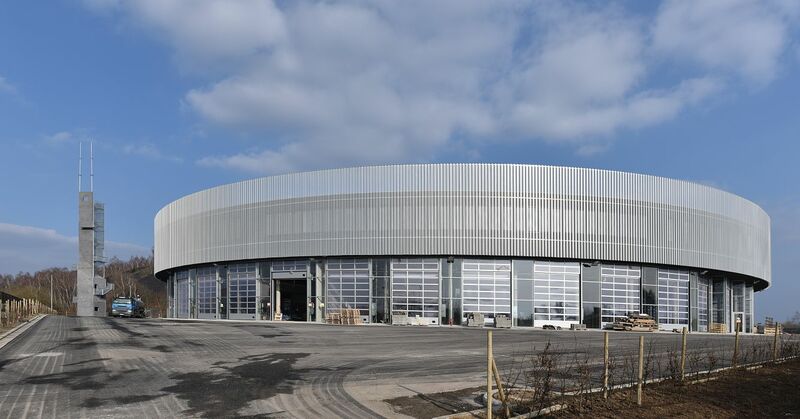 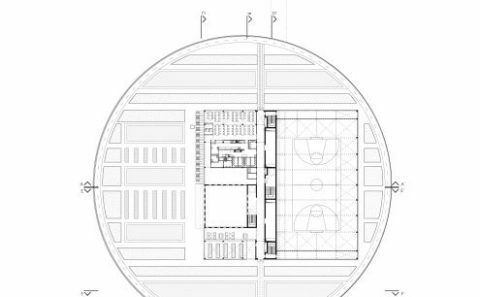 The sports hall is lighted by polycarbonate panels placed upon the roof and on the upper part of the vertical walls. 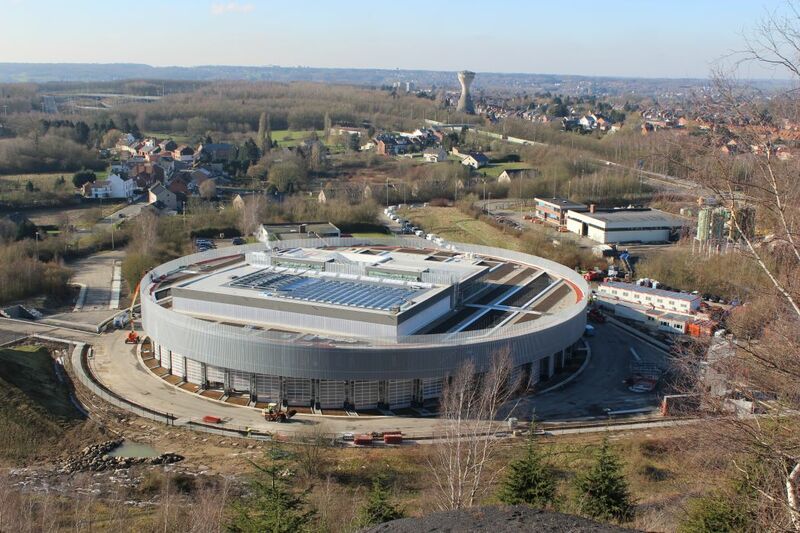 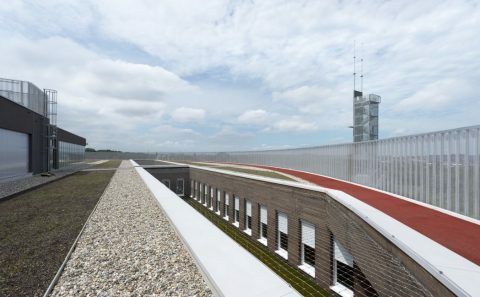 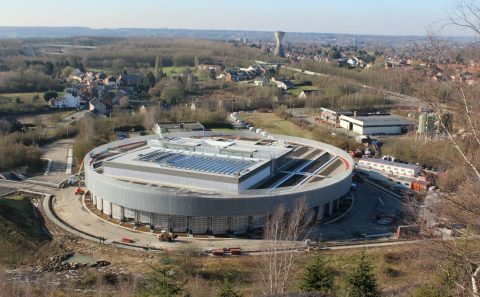 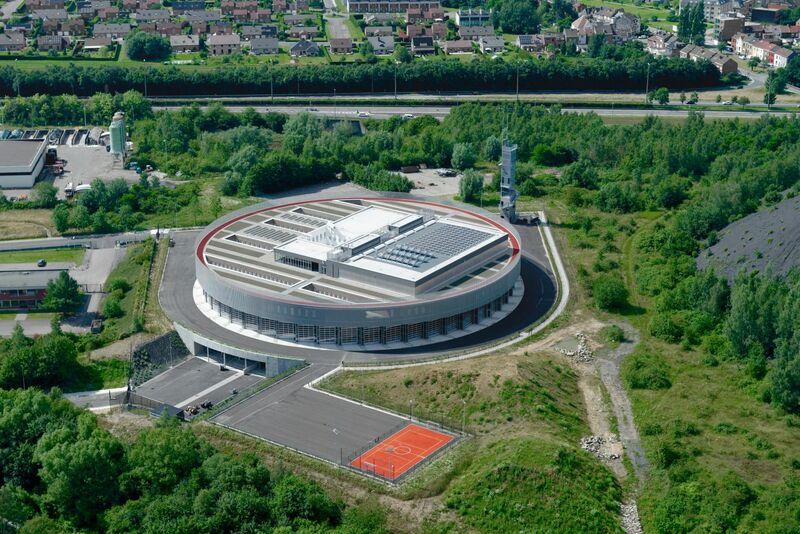 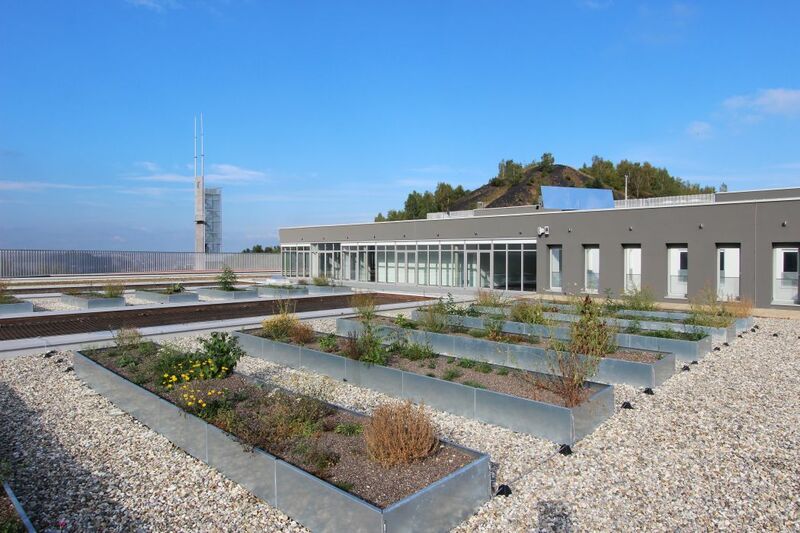 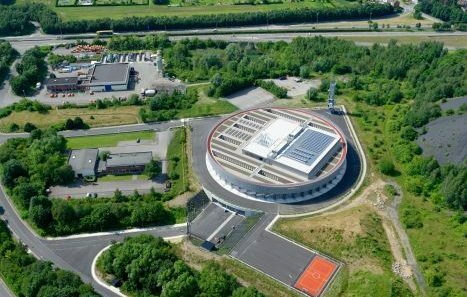 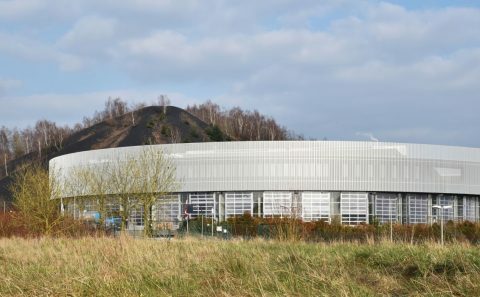 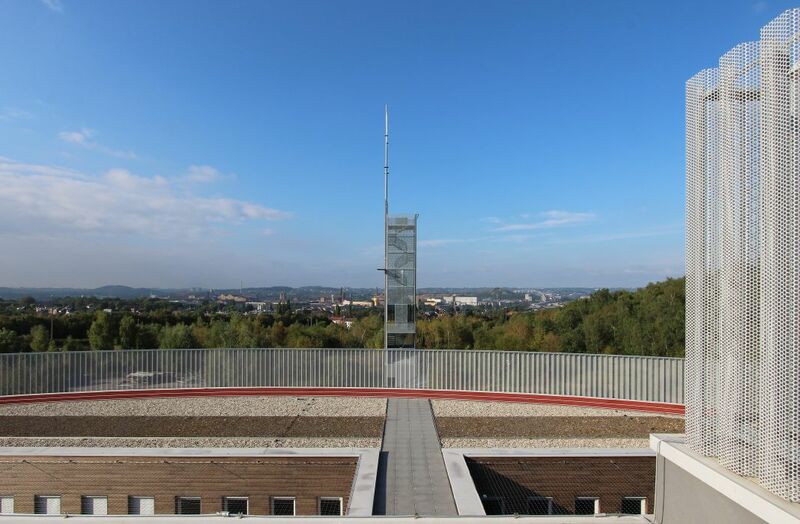 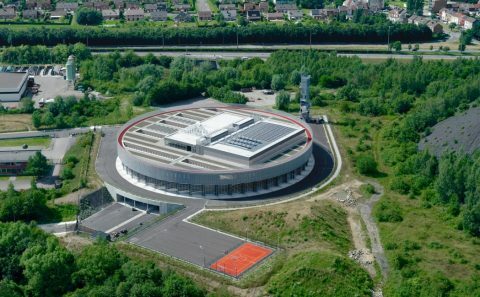 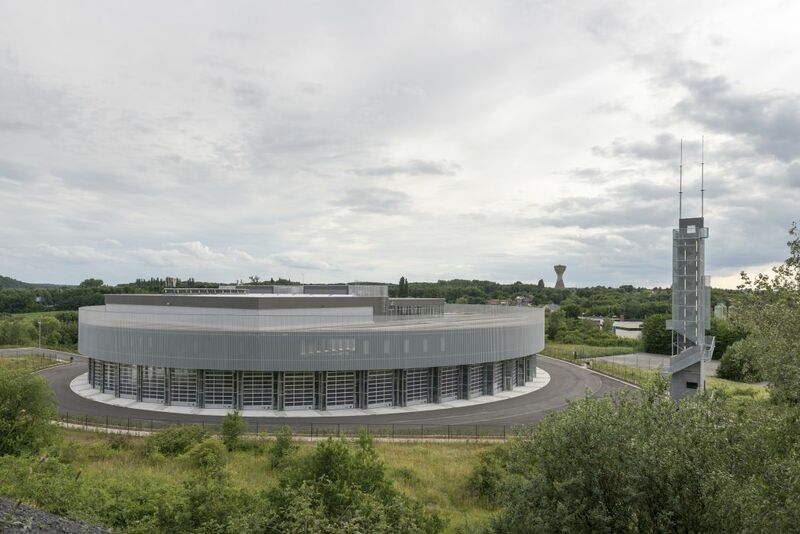 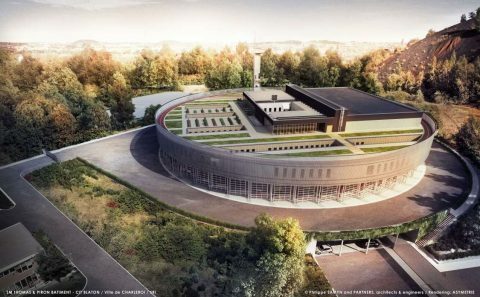 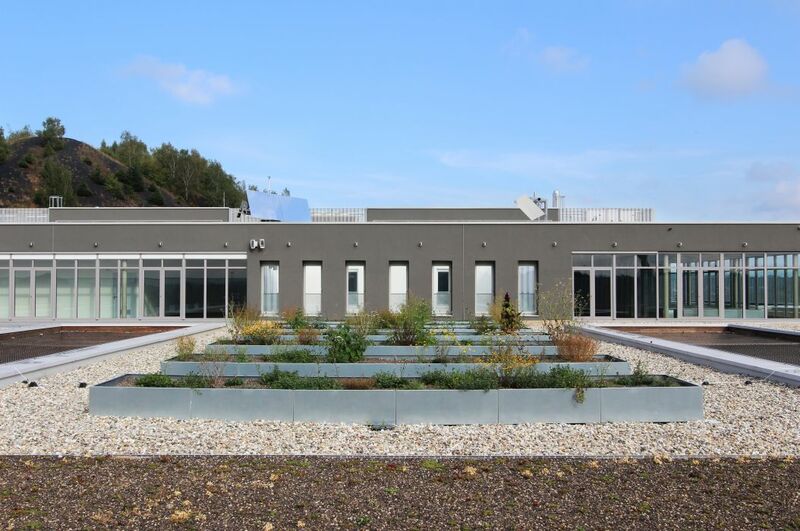 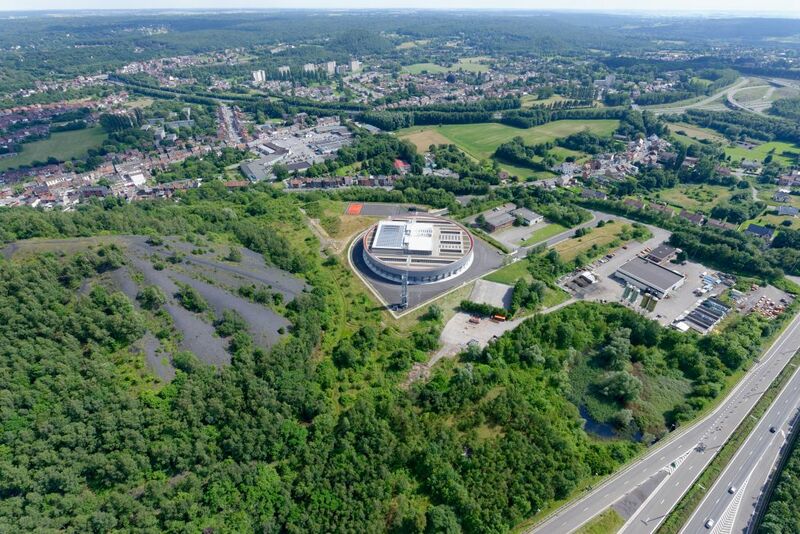 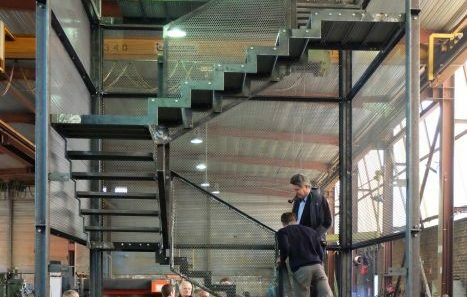 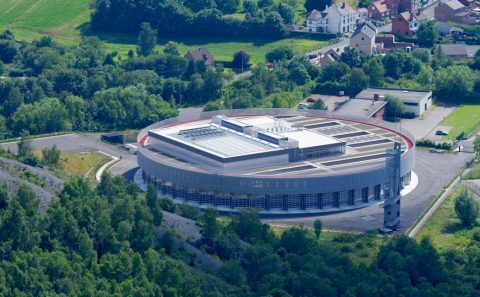 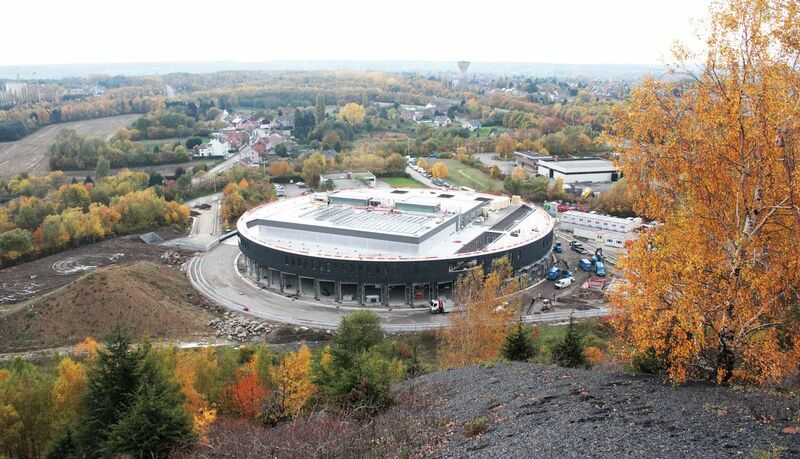 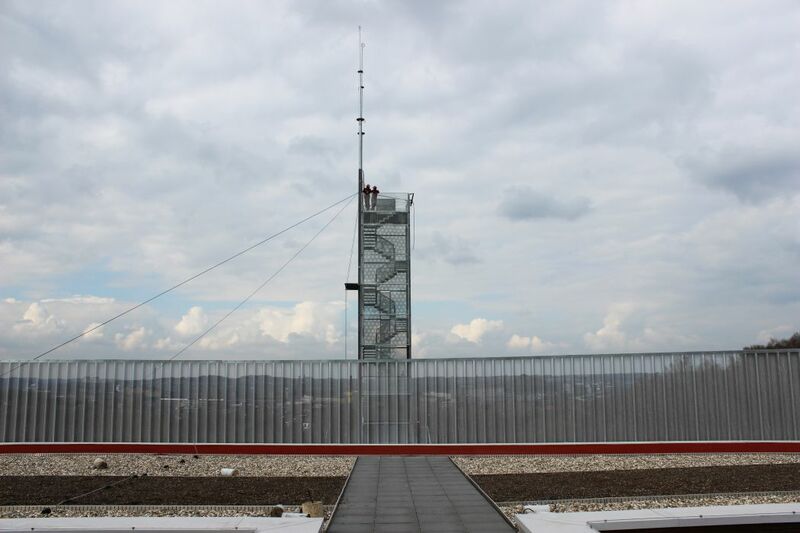 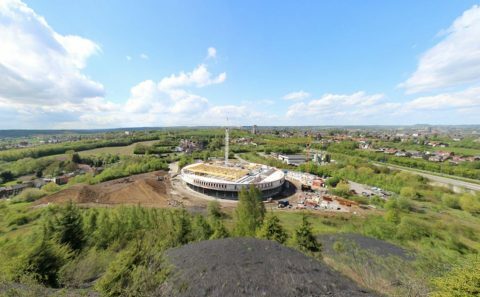 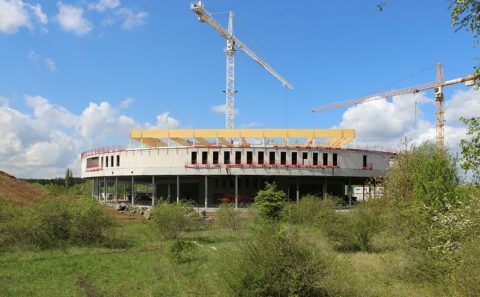 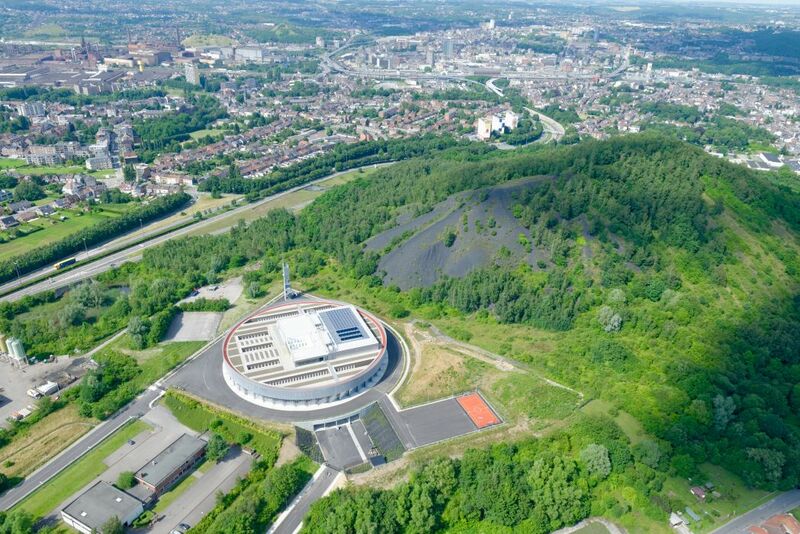 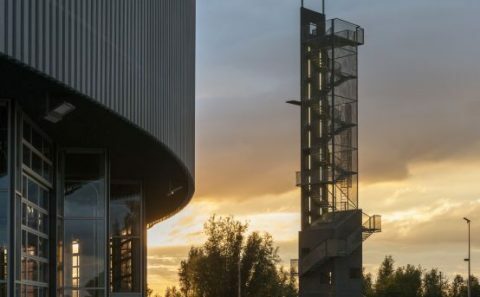 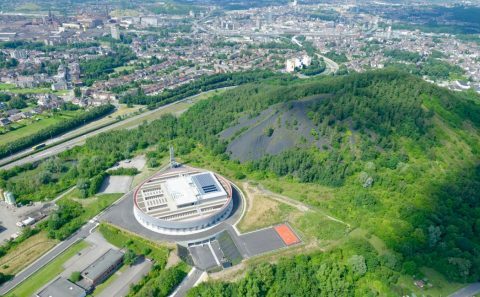 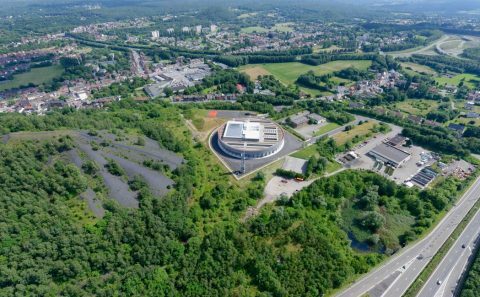 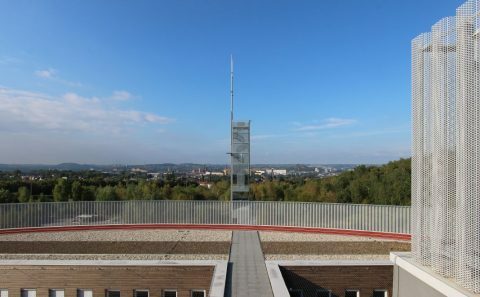 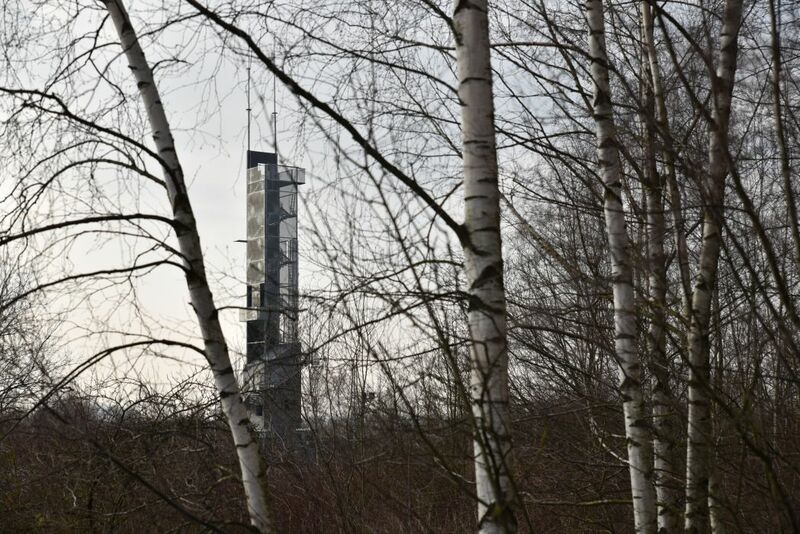 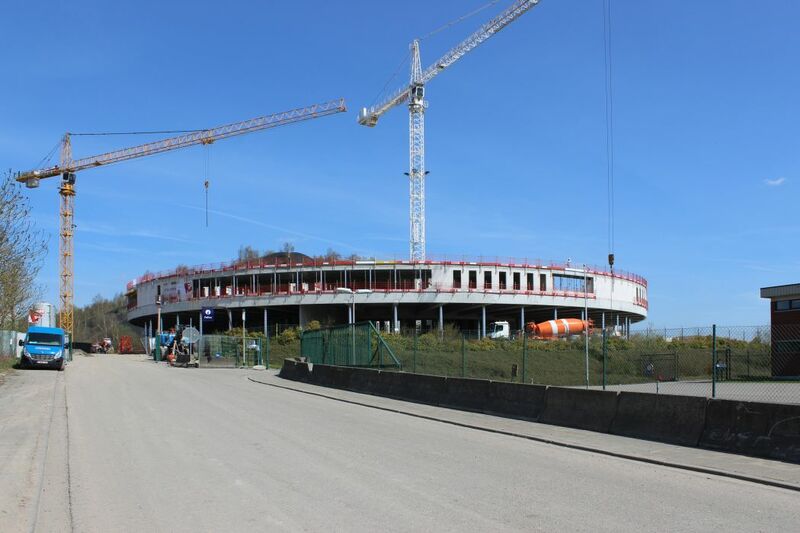 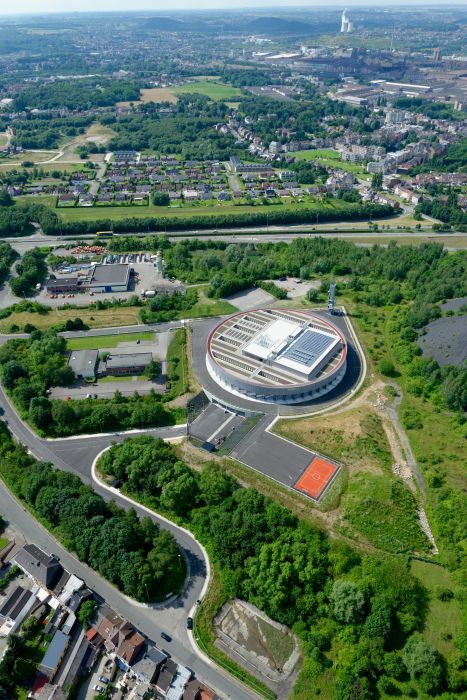 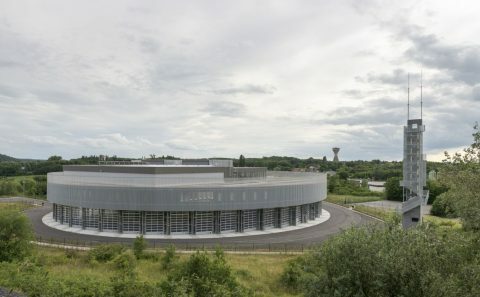 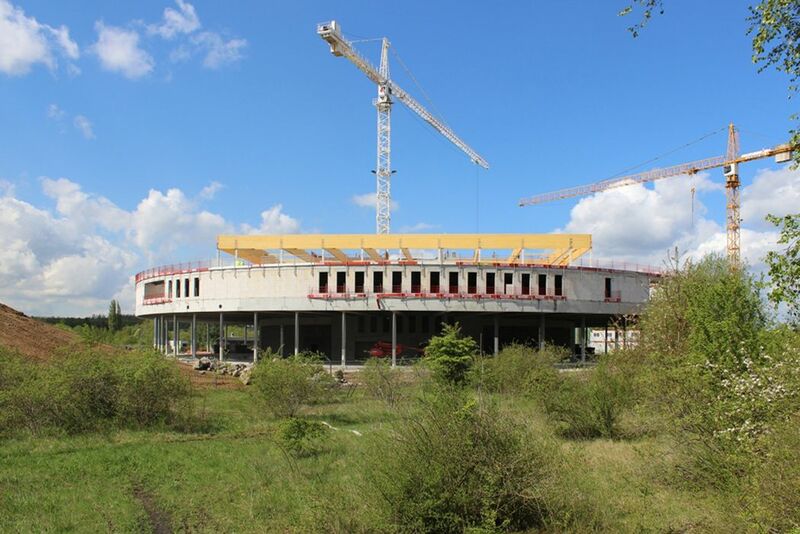 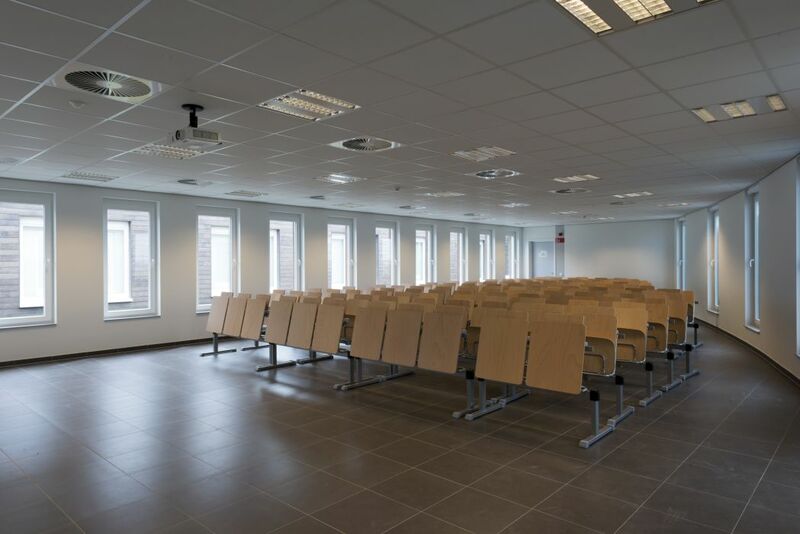 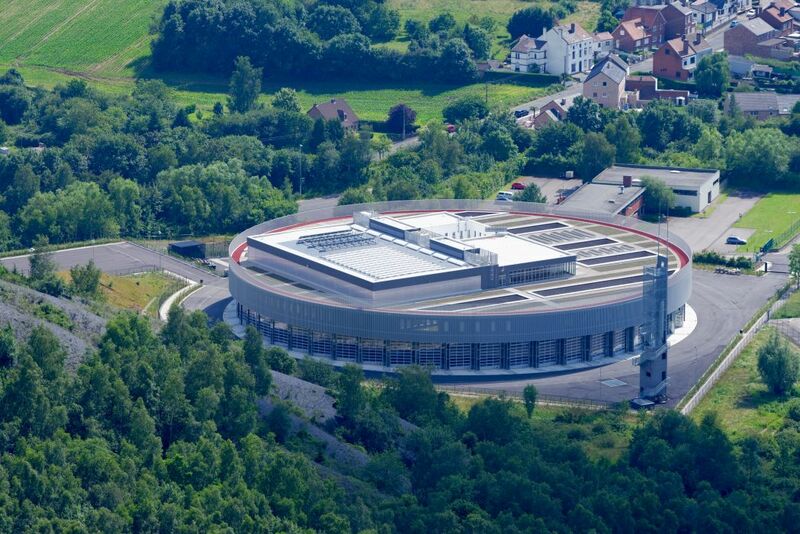 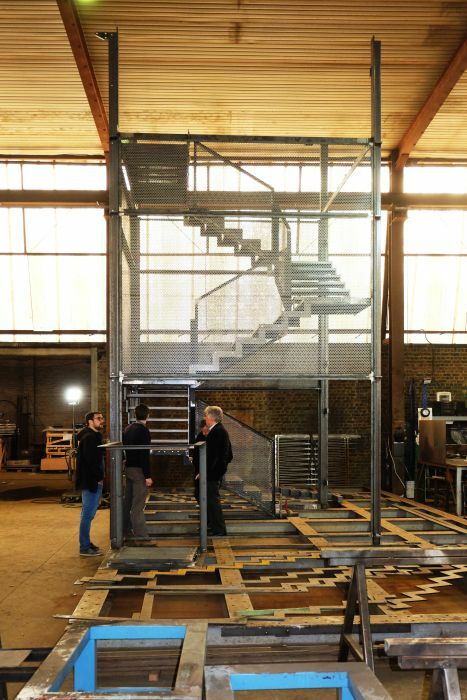 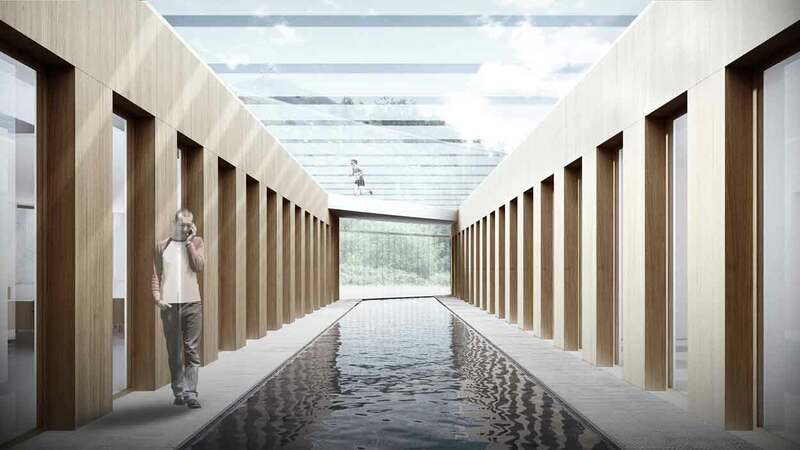 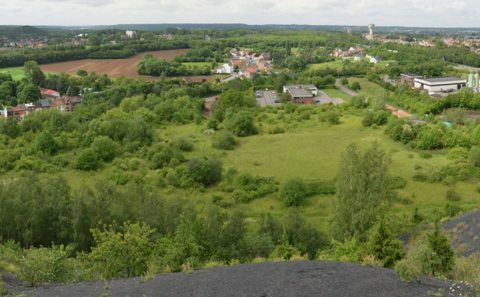 The last level offers a refectory with a panoramic view over Charleroi, as well as a floral and vegetable garden of about a hundred square metres on the roof. 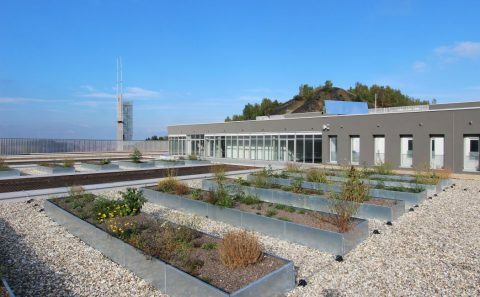 This vegetable garden and greenhouse can provide food directly to the kitchen. 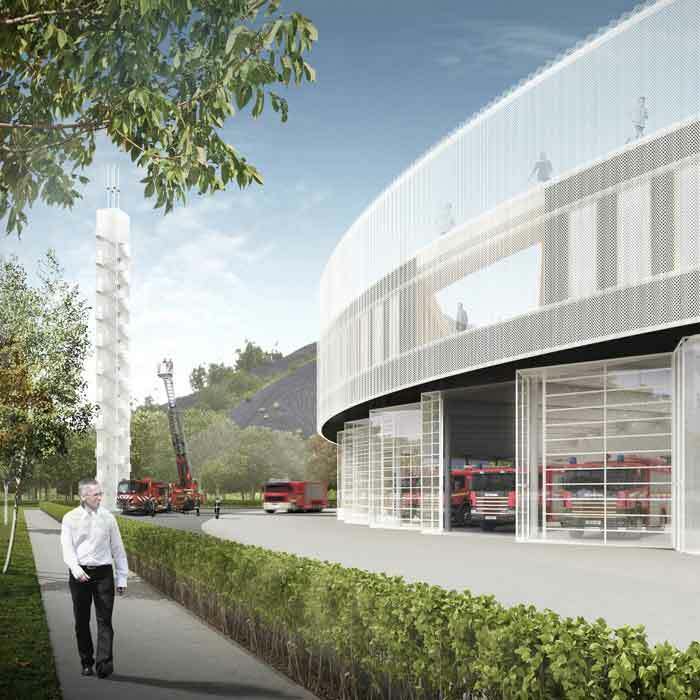 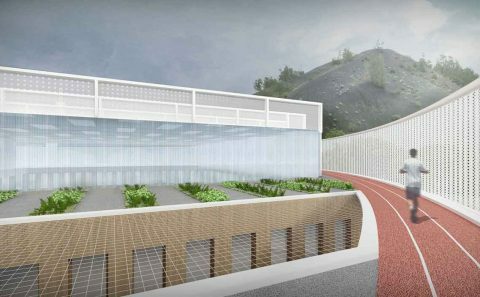 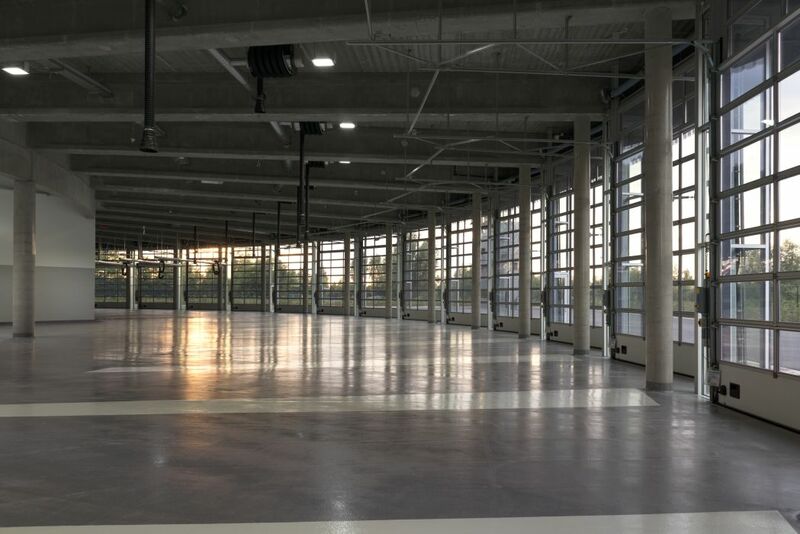 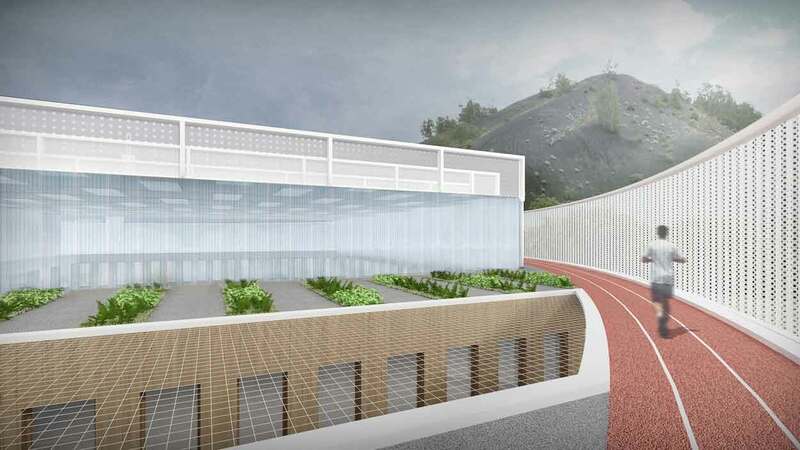 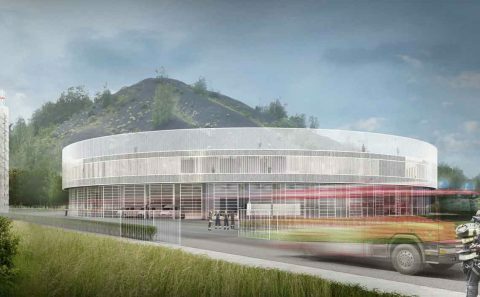 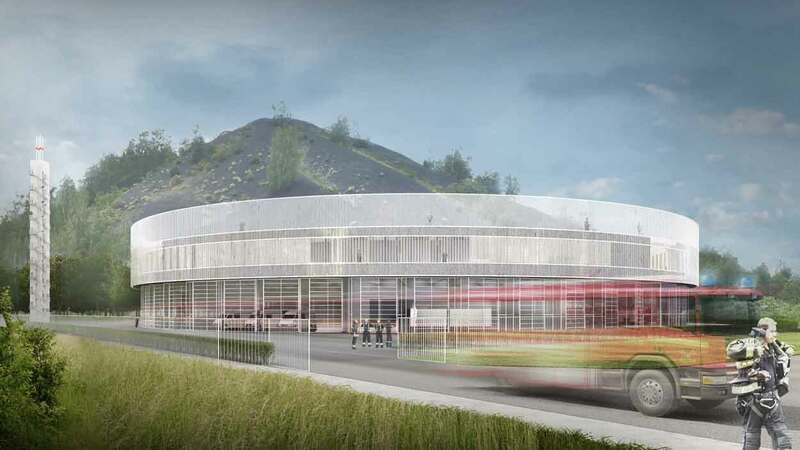 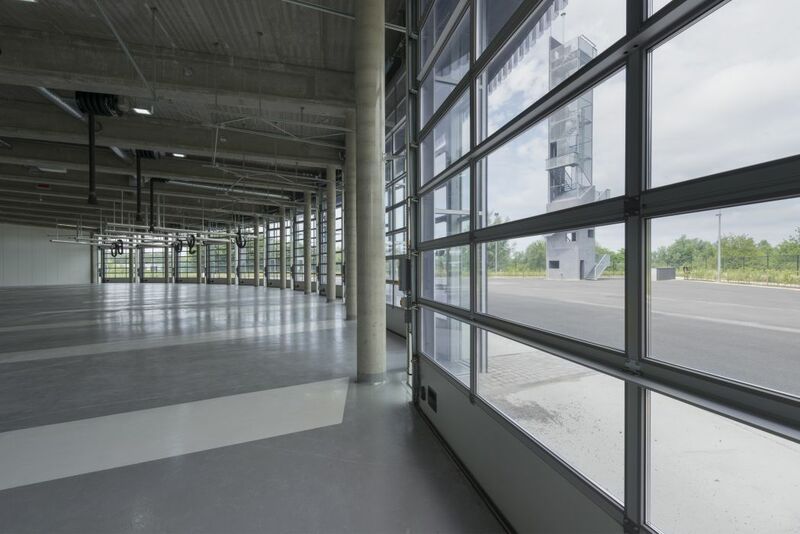 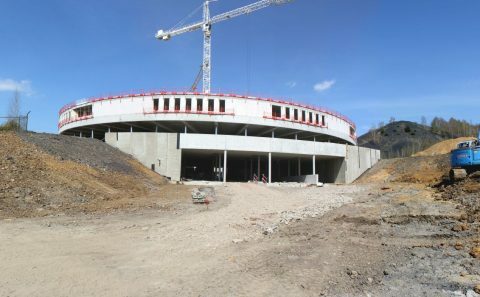 There is also an outdoor terrace next to the restaurant for a bit of sun exposure.This level also has access to the seating levels for the sports hall and an outdoor running track circling the building while offering spectacular views of the region. 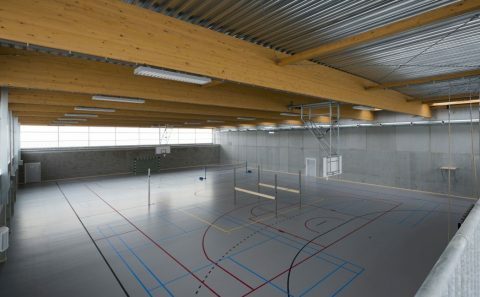 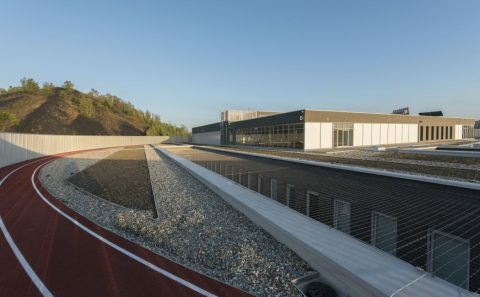 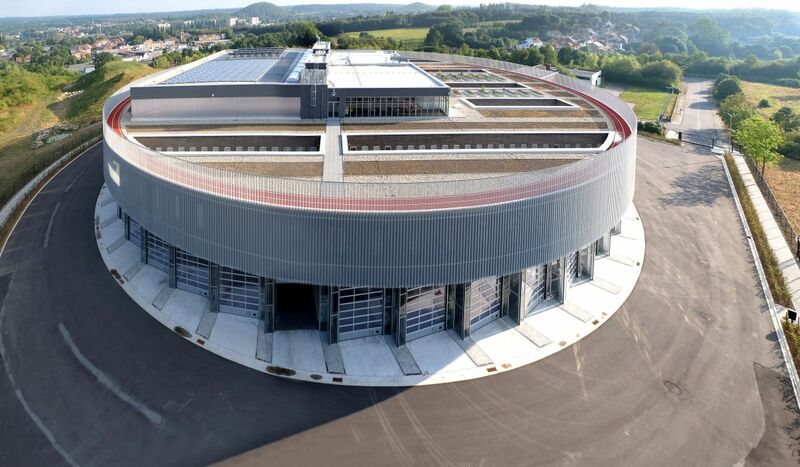 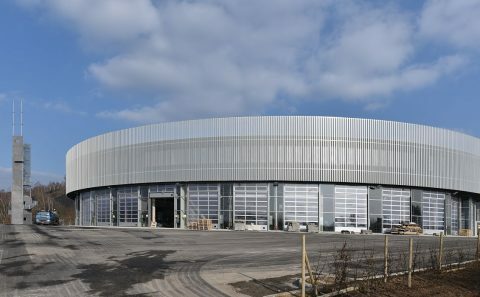 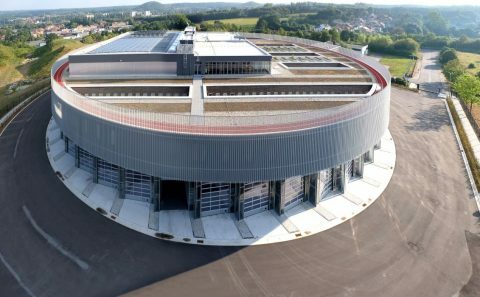 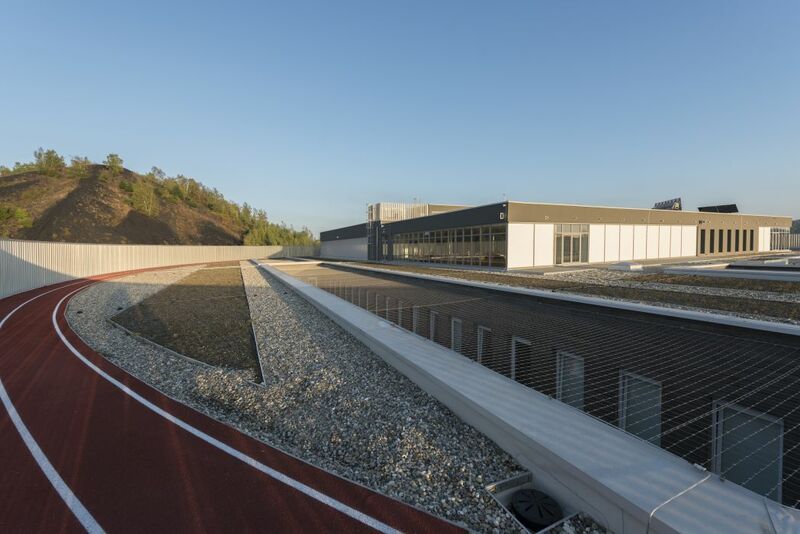 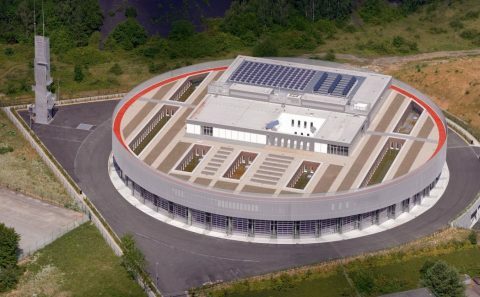 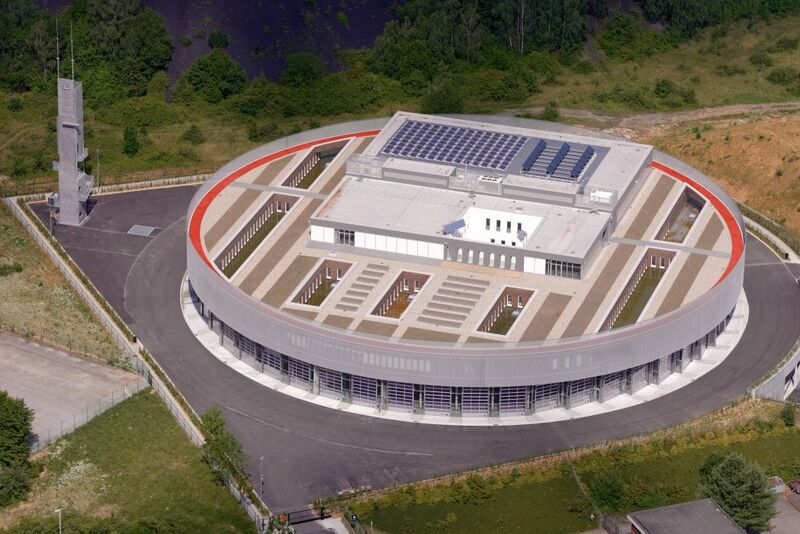 The roof of the sports hall is equipped with photovoltaic and thermal panels providing one part of the electricity and hot water required for the proper functioning of the station. 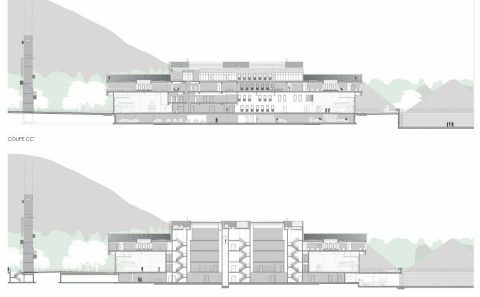 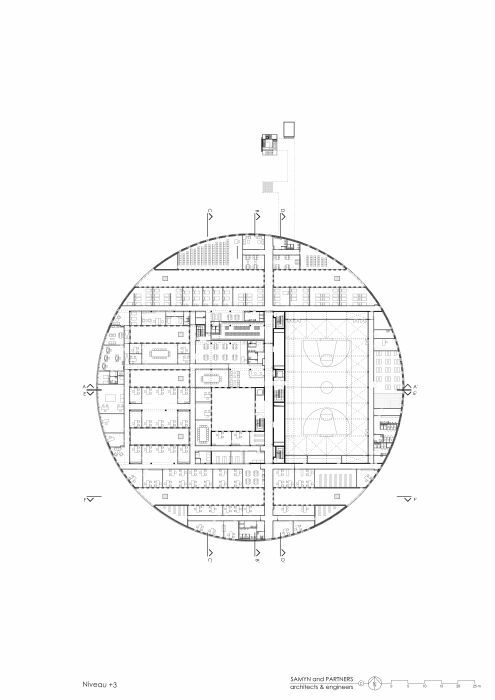 13,359 m² above ground, 6,362 m² underground; 2012-2016; (01/569-1). 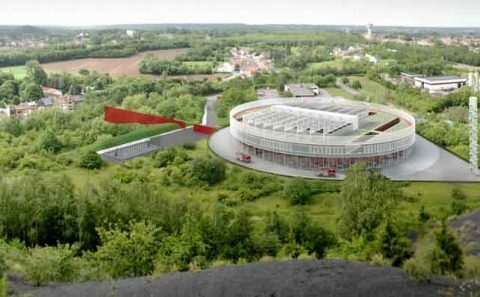 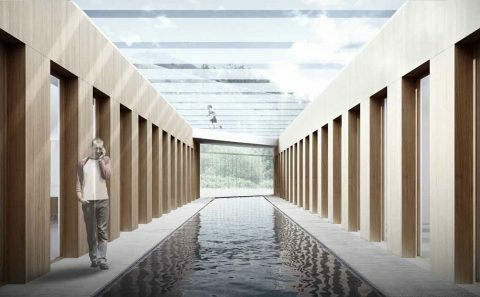 Restricted tender procedure with architectural design competition for the limited-life partnership “THOMAS & PIRON – CIT BLATON”. 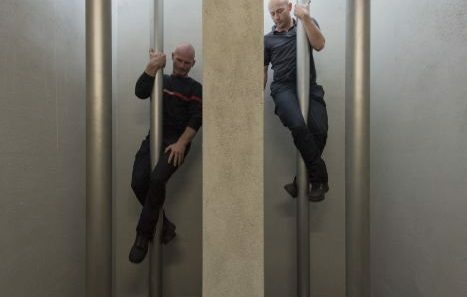 Pascal DELAHAUT, Stéphane GUYETTE, Michel MAES, Joël POLUS. Blandine CAPELLE, Alexandro CHICHIZOLA, Olivier JOTTARD. 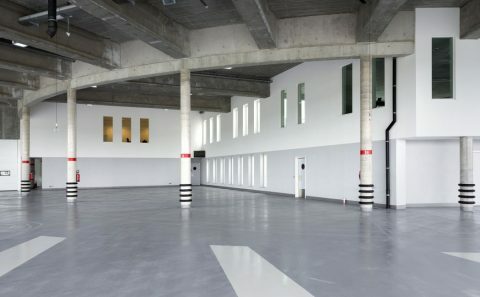 Paolo RUARO, Monika STUDZINSKA, Gaofei TAN, Giulia VENTRE.